Spencer Sawaske started his fishing week out on a high note right off the bat with Captain Jorge by sticking this nice wahoo. Captain Mike Gravert who runs Intimidator Sportfishing on the Sacramento Delta knows how to put fish in the boat and this pig of a pargo liso got yanked ou’tve the rocks…a pretty awesome feat…by Mike near Bahia de Los Muertos! Our amiga, Michele Conklin from Spokane WA with her first big catch-and-release rooster. Here with Captain Jorge. 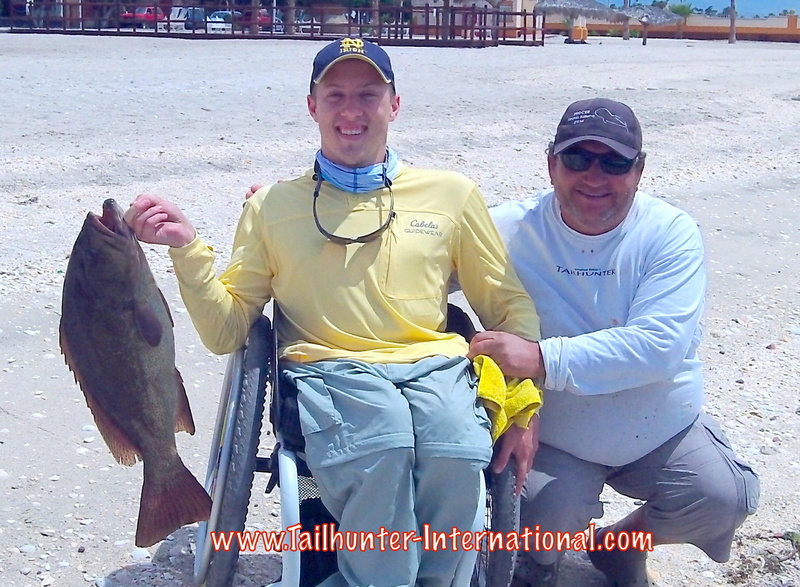 First-timer, Cullen Hennessey with dad, Brian, put the hurt on this big-time amberjack that went about 45 pounds. Captain Pancho poses up! The man they call, “Ranchero.” Rich Sawaske with a tasty tough barred pargo he pulled from the rocks near Espirito Santo Island. Dave Conklin tried to “lend a hand” with his wife, Michele’s big wahoo while Captain Jorge shows how to do it correctly. 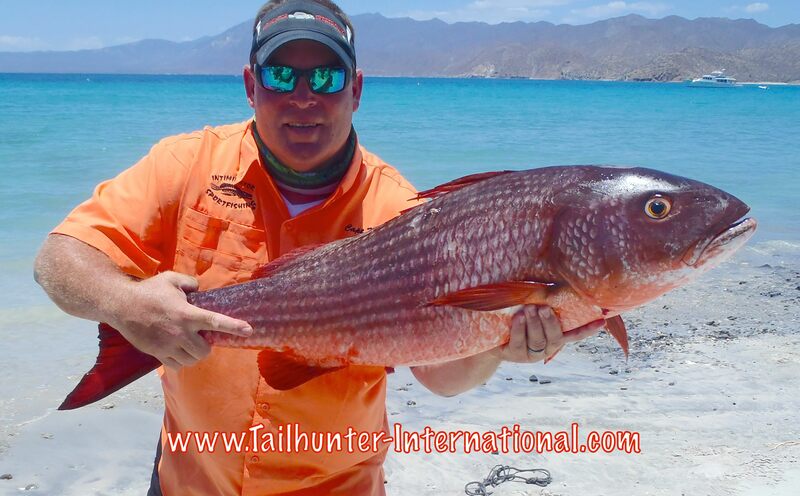 Great amigo, Craig Corda, is always smiling especially when he’s holding a big fish like this fat rooster caught and released near Bahia de los Muertos. Utah in the house! 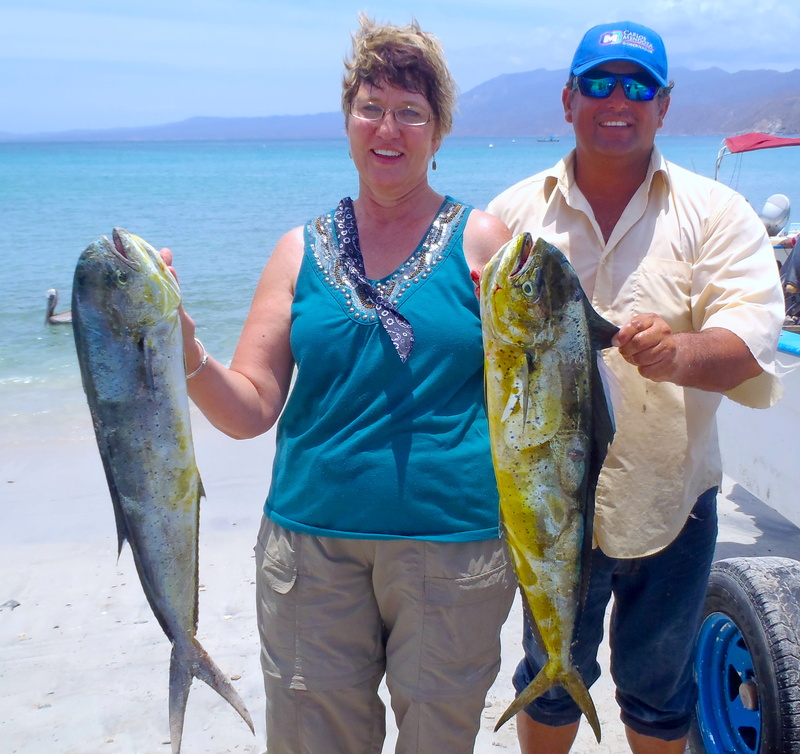 First timer, Lorna Gasser with Captain Armando and two dorado to start the trip! Headed for the dinner plate! 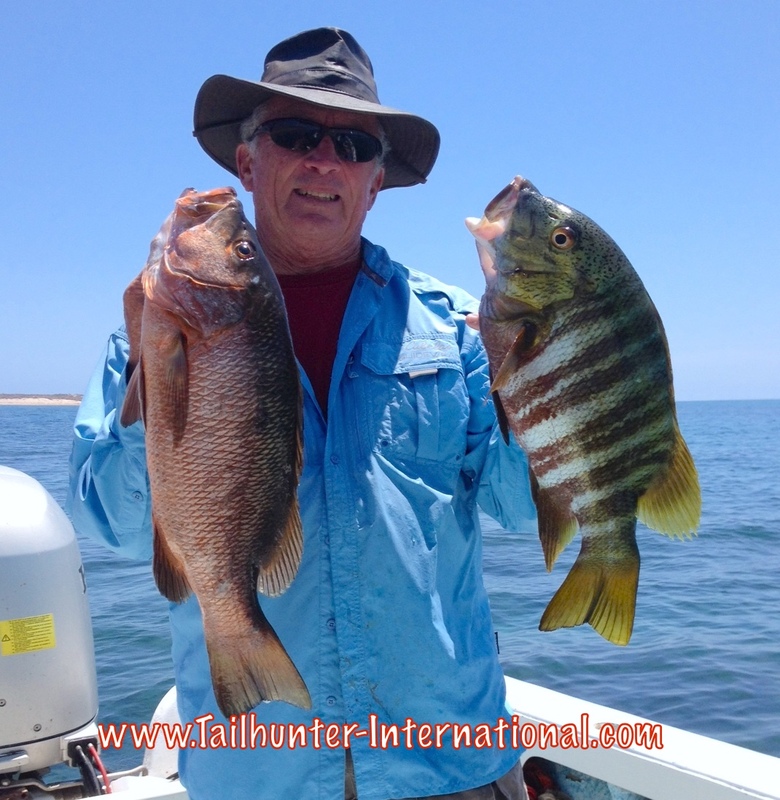 Two great eating rockfish…a dog-tooth snapper and barred pargo for Randy Forrestiere. Kudos again to Bill Jubb for the big heart. 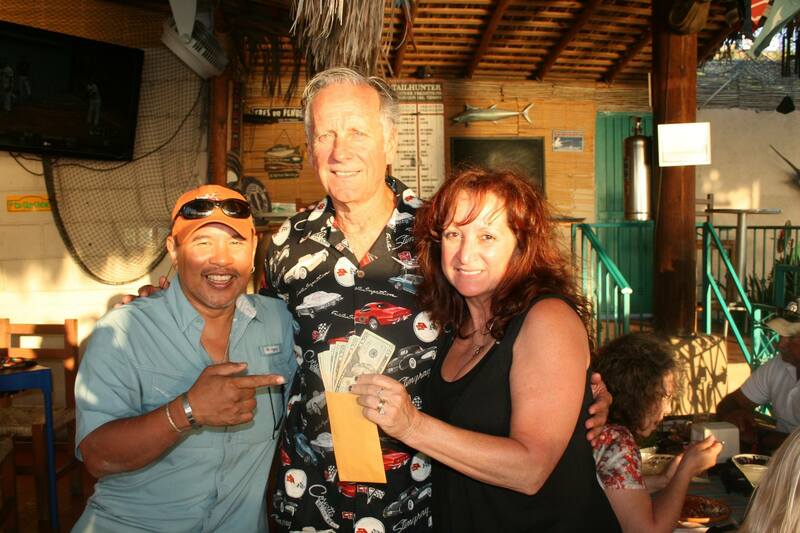 At our recent Western Outdoor News/ Tailhunter Sportfishing Panga Slam event and tournament, Bill won $600. He turned around and paid for everyone’s dinners at the last night dinner, but also donated the bulk of the money to our FANLAP scholarship fund with enough money to send two kids to high school. As a result several other participants also donated additional funds raising enough to send 3 kids to school who otherwise wouldn’t have a chance. We’re grateful and blessed. Thanks, Bill. Thanks, Malina, Dave, Michele and Dave! Weather-wise, it’s been one of the best and hottest weeks of the year as we roll into summer. We had one day hit 114, but most days are about mid-90’s and blazingly sunny. School is finally out for all the local kids. More families showing up here to vacation. Fishing success has been difficult to track however. Personally, it seem more like late May fishing if you look at the our daily fishing reports. Still alot of variety. Still getting some cooler-water fish. Warm water fish just seem to be getting up to speed, but not quite. 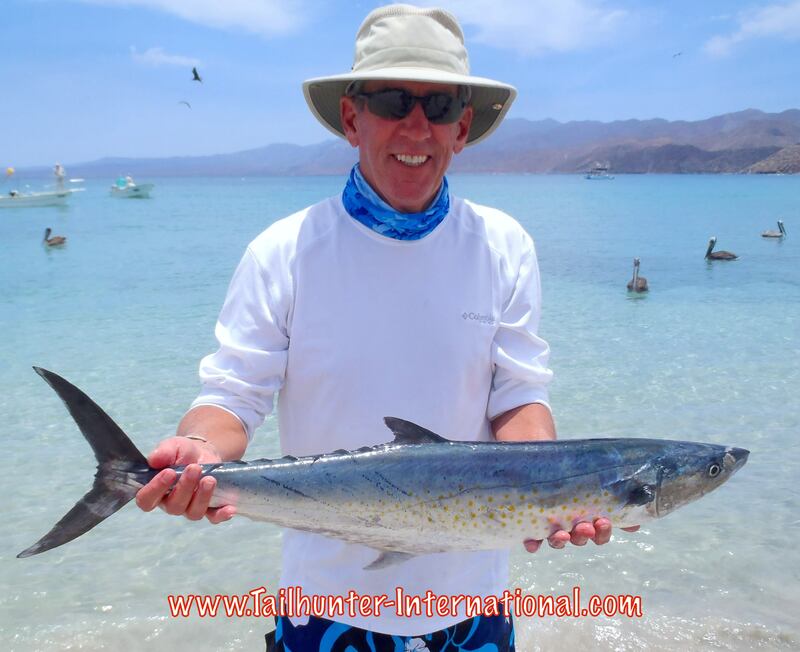 Basically, however, there’s a big difference between fishing Las Arenas and La Paz. Usually, this time of year is where we see the most variety of fish. Not so this year. At least, not so far. Right now, I’ve been telling our anglers, it’s BIG OR GO HOME! This is home run territory. 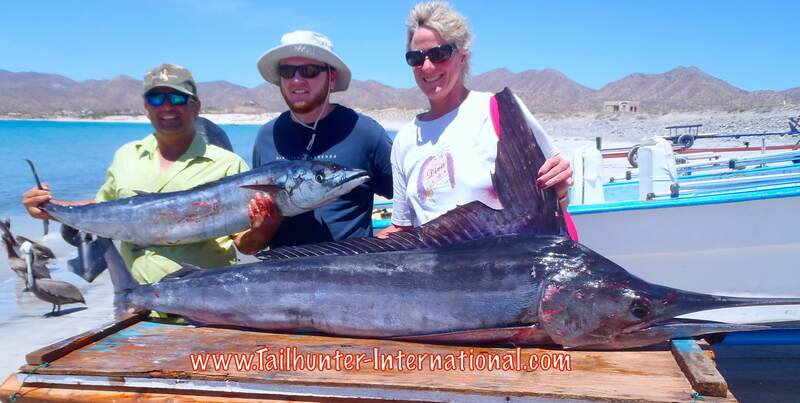 Other than some smaller bonito or rockfish, it’s either big rooster fish, wahoo, or billfish. If you get a shot and miss it, you get skunked. That’s it. Go home with a good story. And alot of our anglers miss fish or they bust off. It’s fishing. That’s why these are bigger fish. However, if you land one of these guys, then you’re the hero. This past week, most of our roosters were 20-50 pound fish. Nice trophies. Nothing to bring home to eat, but a trophy photo and catch-and-release just the same. Some of our anglers landed 1-5 of these fish some days. 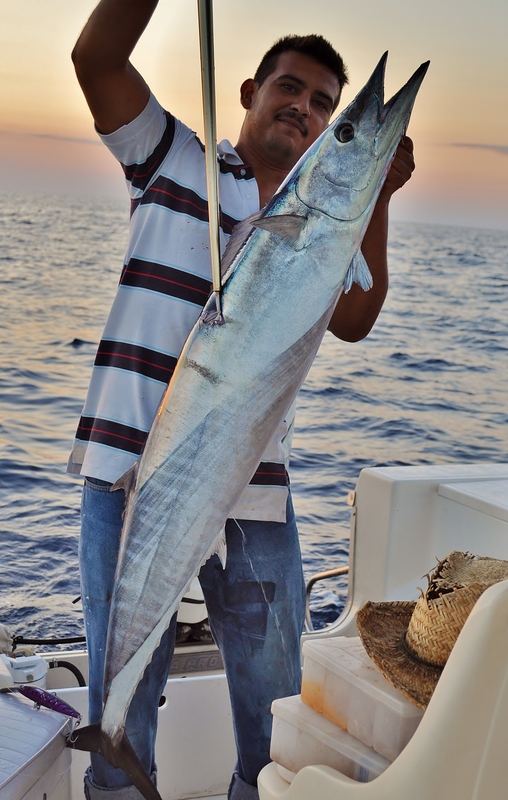 The wahoo…a bit more anemic this week. Is this the end? We’ve had one of the most dynamic wahoo bites in memory the past 4 or 5 weeks. Epic. We have caught more wahoo in recent weeks than the last 10 years COMBINED! But this past week, there were only a few hooked and even fewer landed. Chalk it up to angler error…hard-fighting fish…changing conditions? I don’t know. But, it’s been great and I hope it’s not done. Marlin seem like they’re waking up. We got a few. Most released. Most about 100 pounds. Late Saturday, tuna between 30-70 pounds were landed by commercial guys at the south end of Cerralvo Island. We’re exploring that as I write this report. Again, nothing small. Anglers are either totally blown away when they land one of these fish or they come back disappointed. It’s the nature of fishing and at Las Arenas right now, you get 1 or two shots. If you miss it, that’s it. Fortunately, we have two fleets! Just for this reason so we can move our clients back and forth depending on conditions and the bite. Luckily, most of our clients are here for a few days so they have the ability to fish with both of our fleets! Our La Paz action has been well…just that…ACTION! Dorado have been more active and there’s schools of smaller to medium sized dorado now showing up. Limits or near limits of these smaller fish are not uncommon and we’re just waiting for some of the larger fish to show up. We did get a few in the 20-30 pound range and larger fish lost. 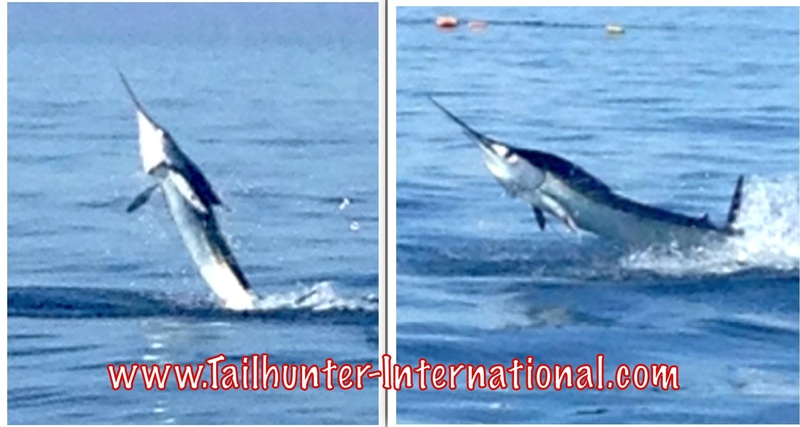 For larger species…Billfish and sharks also providing action with both species being released or lost. One of our frequent amigos, Dave Lindell, from Pendleton OR with Pat McDonell from Western Outdoor News and Dave’s big wahoo…his first. This might have been the largest fish of the 3 day event. Dave had several others hooked up as well. 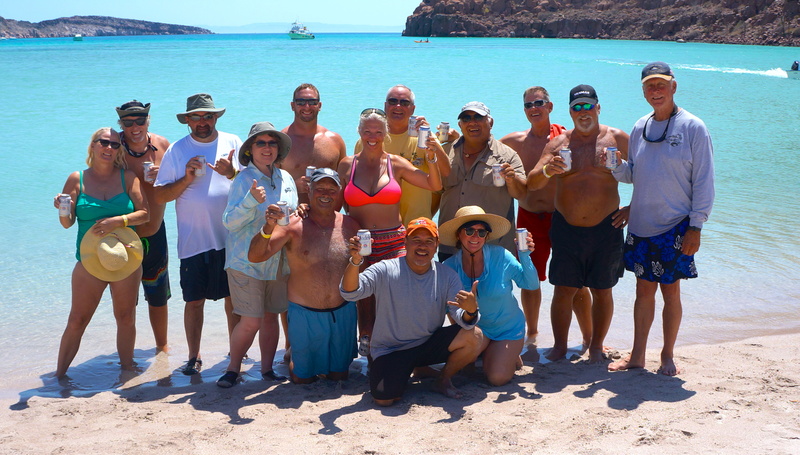 Some other great fun amigos and always a blast to be around Dave and Michele (“with one “L” ) Conklin who also had some big fish and out of everyone might have also caught the most fish of any team in the Panga Slam event with the number of hookups they had each day. They’re from Spokane WA. Love this shot of good friends, Cathy and Craig Corda with Craig mugging from the panga as Cathy holds their big wahoo! 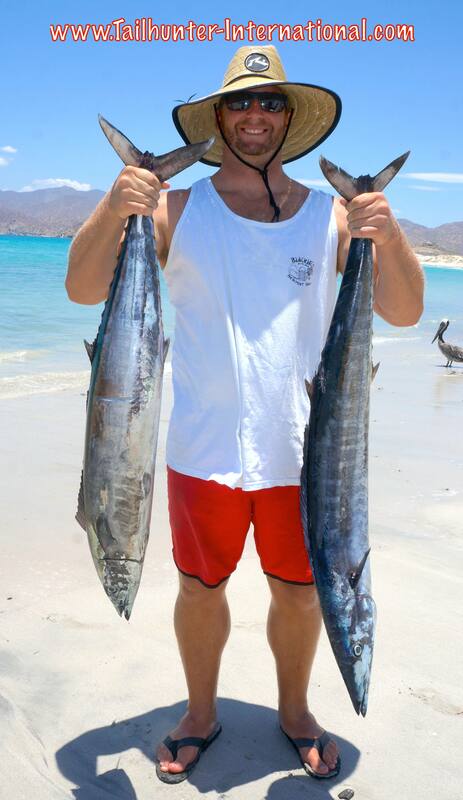 First timer, but hopefully not the last time, Paul Csenar from Newport Beach is another of our amigos that got his first wahoo this week…in fact, he got TWO! He also got his first marlin this week as well. On fire! 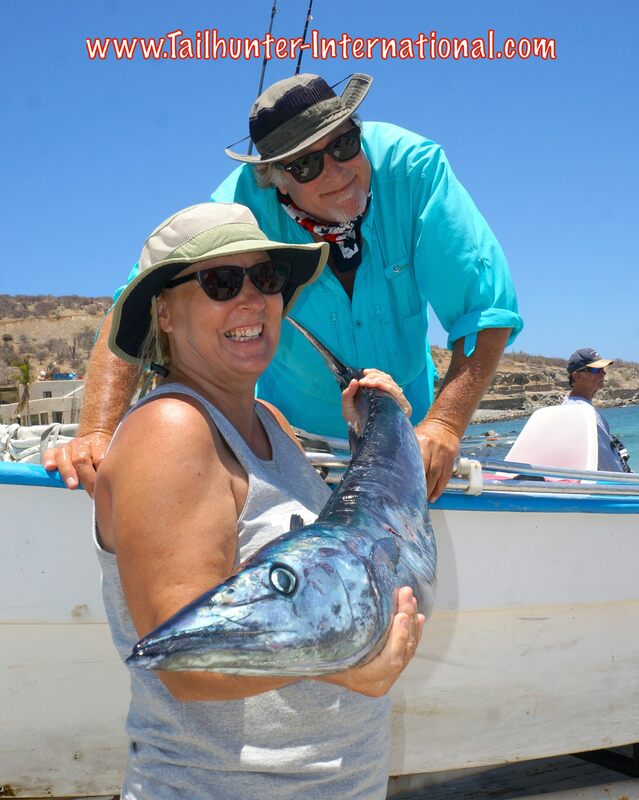 Michele Conklin with the largest dorado of the week with husband Dave and a nice cabrilla. They had more hookups than anyone else and a great variety of fish! Big smiles from Ron Lawver, Sr. from Washington and Captain Victor with a trophy roosterfish in flat waters near Las Arenas. The fish was released. What the heck? It’s June! 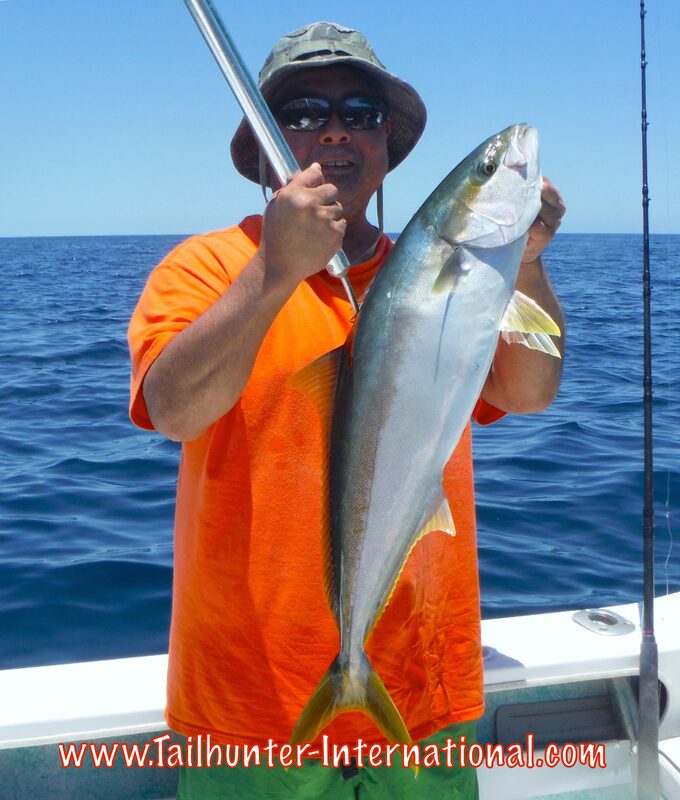 Phil Okamoto got this yellowtail off Espirito Santo Island. No one could believe it until we saw the photos and the fillets. Most yellowtail run from February to Apil when the waters are cold. Waters are almost 80 degrees right now! 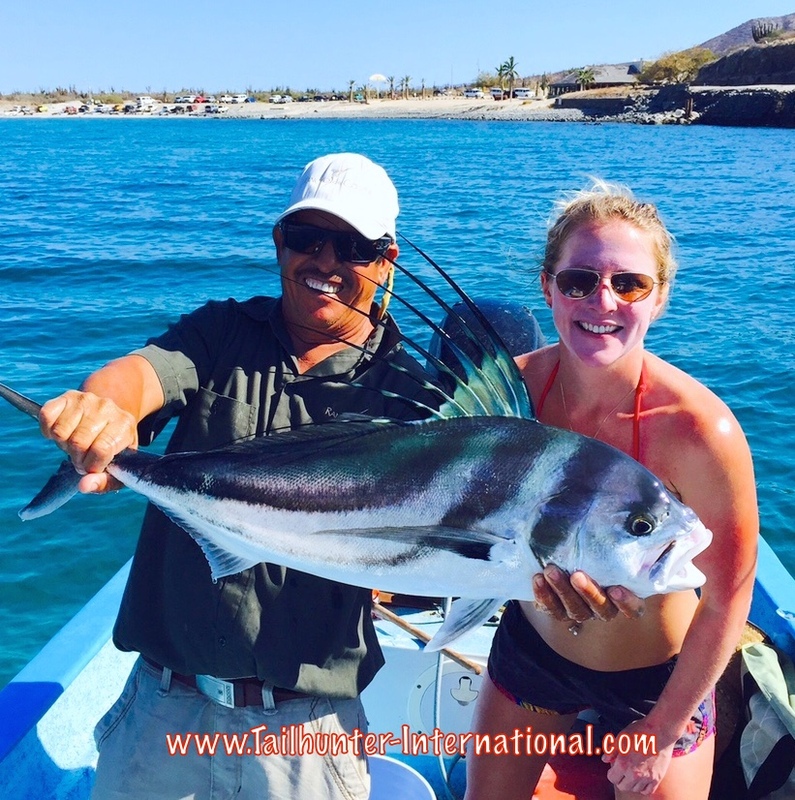 Right there in Bahia de Los Muertos, there’s some nice schools of roosterfish like this one caught by Catlyn Wagner right near where we launch the boats. Her dad is good amigo, Gary Wagner, who owns the famous Giggling Marlin Restaurant in Cabo San Lucas. The fish was released. 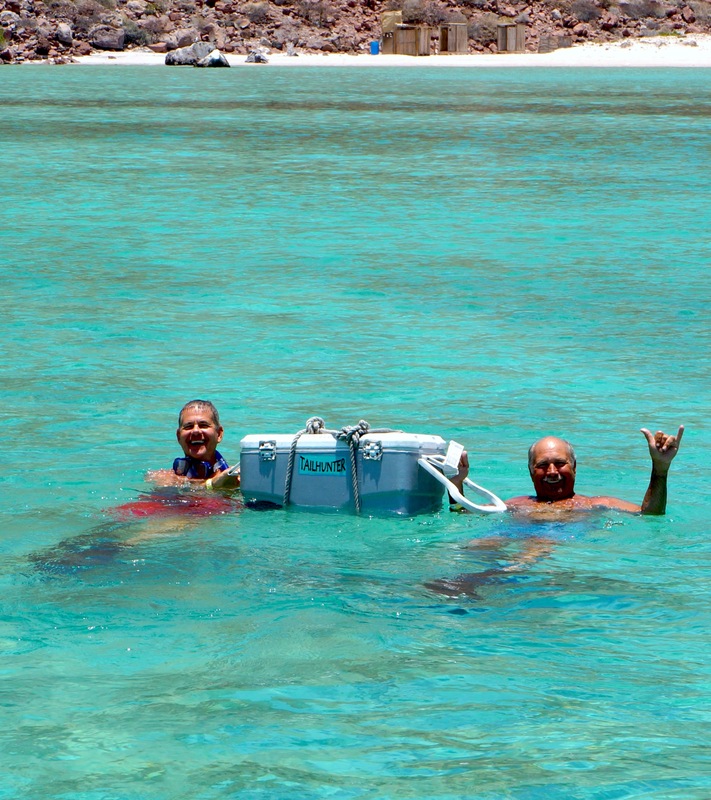 Candid photos like this one with our Captain Rogelio and Orhan Gurbuz with his big cabrilla are gems! Boy did I goof!!! I’m really meticulous about photos on these fishing reports that I’ve done now for almost 20 years. But, I forgot this photo from two weeks ago of our own Uncle Johnny Enright and his wife Nancy! OMG!!! Sorry, Johnny and Nancy! I owe you some big time drinks at Tailhunters next time!!! Kansas in the house! 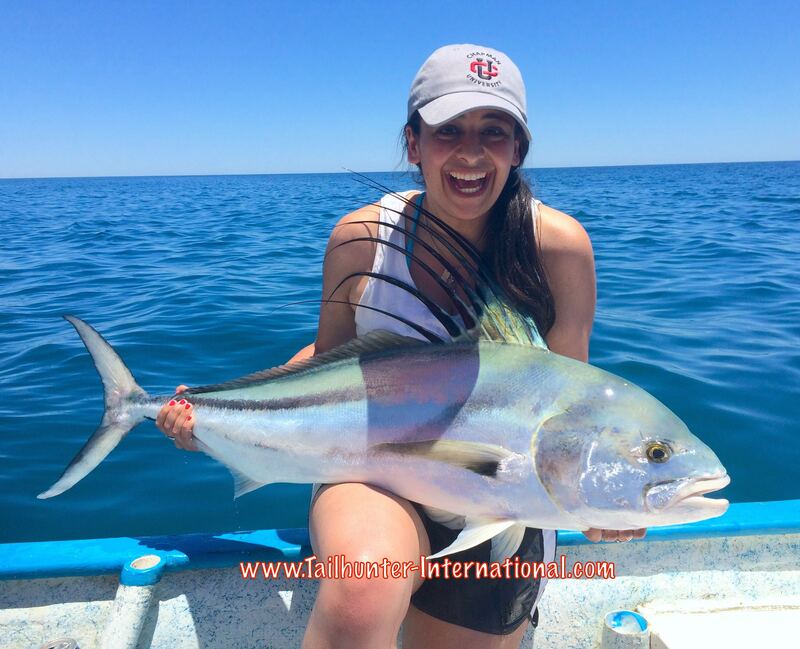 Marion Lawver with another fine roosterfish off Bahia de Los Muertos in flat calm waters! Fish was released. Surprise catch for Phil Okamoto and Kristine McGrath. 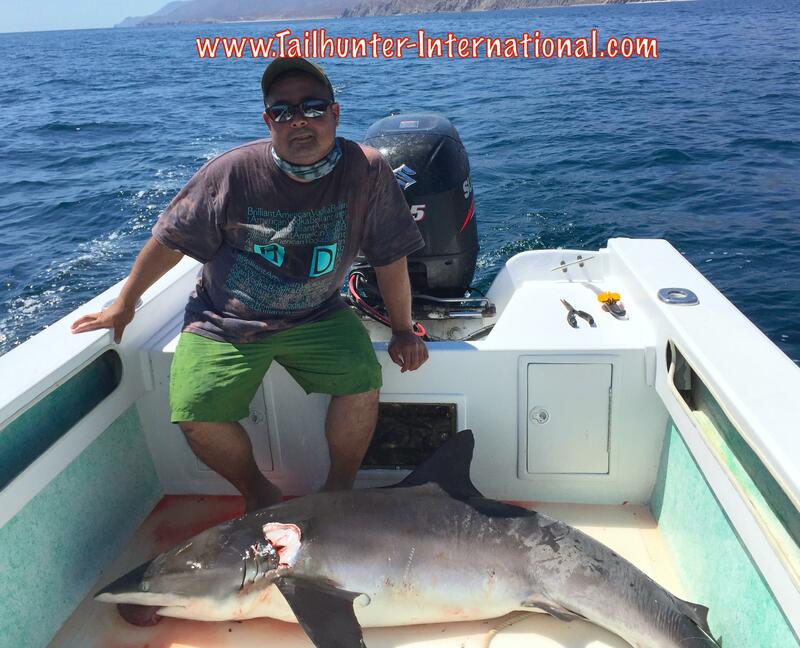 While fishing Espirito Santo Island with our Tailhunter La Paz fleet, they got a double hook up on two big sharks that they thought were makos, but turned out to be blacktips. One eventually busted off but the other took a two hour fight. It yielded some beautiful white tasty meat. Phil stuck his camera underwater to take some shots and turns out…there were as many as SIX other sharks under the boat! Happy Father’s Day Everyone to you and your families and all dad’s everywhere! The week started off with all of us watching with a bit of trepidation as Hurricane Carlos was building far to the south of us. Just what we need! But, like many others, Carlos petered out long before it ever touched Baja and went inland leaving us with a great week of nothing but warm blue Baja skies…temperatures in the low 90’s…and water that seems to keep growing prettier the further we get away from the last storm, Blanca, two weeks ago. Blanca put the hammer on what had been an increasingly good fishing season. So, now that it’s passed, it seems with each passing day and the further we get on the calendar away from Blanca, the better the water gets and hence the better the fishing seems to be as well. Although, Storm Carlos did send some wind and big waves our way! Overall, a pretty decent week of fishing. It’s been better, but this week was not all that terrible by any stretch! It just could have been even better as things try to right themselves and get on an even keel. As mentioned above, with each day away from the storm, things get better. Prior to the storm, we had an epic wahoo bite…probably the best I’ve seen here in the 20 years I’ve been working down here. So, anytime something like a weather-related event comes along, I get worried. Well, the wahoo sure seem to be back. 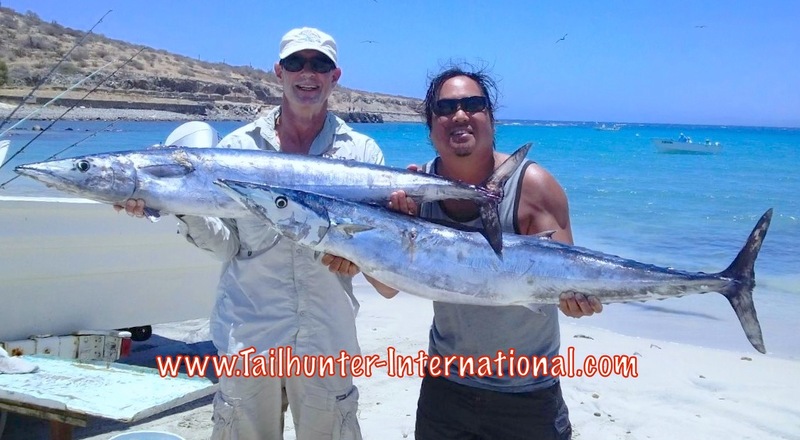 As one of my guys told me, “There were free-swimming wahoo all over the place!” Never seen anything like it. The fish are sticking around for some crazy reason and surely no one is complaining. The fish are 20-50 pounds and eating bait as well as lures like dark-colored Rapalas. Rapalas, especially purple and dark-colored black/ white or grey combinations have been hot. Bring some down if you can. Especially the Rapala CD-18 or even better, the Rapala X-Rap 15 of Rapala XRap 30. The stores here in town keep selling out even with the price tags of almost 40 dollars for them. Worse is that many anglers are losing their fish so if the lure belonged to a captain…adios…there goes $40 bucks! If you have time, take the treble hooks off of the lures and replace them with single hooks! But, the truth is that these are home-run fish. Big or go home! For every fish we put in the panga, 2-4 fish are lost! Or, worse, many times, one of our pangas come in and the anglers have long faces. They got nothing, but tell me they lost 3, 4 or 5 fish! These fish are fast and hard chargers and they have sharp teeth and a hard jawbone so you really have to stick that hook hard when they bite. For other fish, the other news is that it seems the marlin really woke up…finally! Quite a few marlin getting hooked up. Mostly stripers and blues with stripers going 90-120 pounds and blues up to 300. Every day this week several were hooked up and fortunately, most fish are getting released. Additionally, rooster fish were back nicely in the counts. 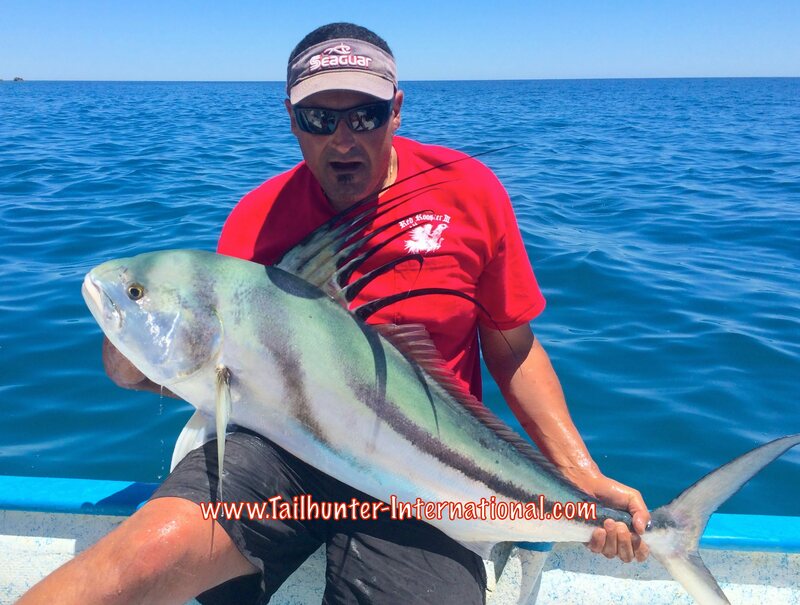 Most fish were 15-30 pounds, but there’s a school of 2-10 pounders right in Bahia de Los Muertos and if you just wanted to stay in the bay and catch-and-realease small roosters all day, it’s not out of the question. Not many dorado showing up which is a surprise! Again, the conditions are the dispositive factor. Late in the week we had big waves and winds that were residual effects of Hurricane Carlos way to the south of us. Although the sun kept blazing and we didn’t get any storm conditions, the storm did send up waves and wind which then affected the fishing negatively. 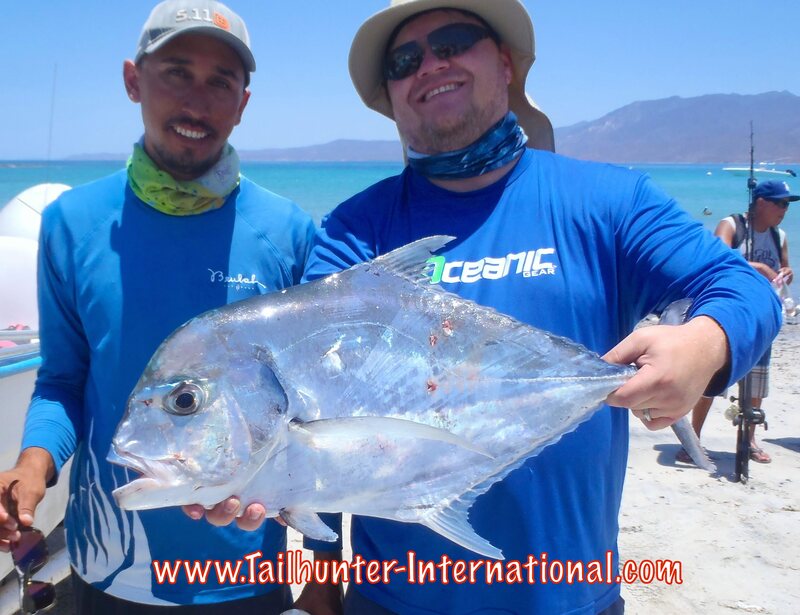 Good bit of variety for our Tailhunter anglers fishing with our La Paz fleet. More dorado showing up in the counts although, not alot of big fish just yet. Most fish are schoolie-sized 5-15 pounders with the occasional 20 pound mahi in the box. I expect this is just the opening round and the mahi fishing will get better. Lots of and lots of little fish around and sure, you could put a big dent in your ice chest fishing some of the trout-sized dorado, but what’s the fun in that? Hopefully, bigger and tougher guys will arrive as we move into summer. For other species, our pangas are still finding some great marks of pargo mulatto and yellow snapper as well as some hefty trophy-cabrilla. As well, we are also seeing more anxious billfish like sails and marlin and rooster fish in some of the coves up to 50 pounds. It was one of our smaller groups in the 16 years we have held the event, but perhaps one of the funnest groups we’ve had here in my memory. The fishing could have been better. We’ve had better outings. But it’s hard to have had a better bunch. Or a more gratifying result. Please read to the end and find out the surprise ending! 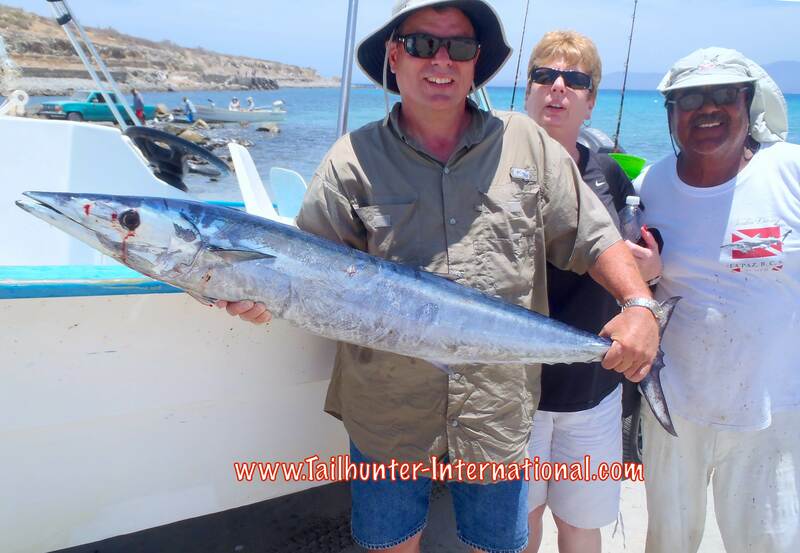 Day 1 we fished Las Arenas and got into some nice wahoo and marlin. For some it was their firsts of those species. We didn’t have a scale to the beach, but biggest fish was probably Dave Lindell’s wahoo (Pendleton OR) or Dave Conklin’s wahoo (Spokane WA) . Tom Robinson from Orange Co. took his first marlin after a bruising 2 hour fight on a little Avet reel and released it to fight another day. That night we went with the group to Costa Restaurant at the marina for some great seafood and live dance music. Our favorite alfalfa farmer, Craig Corda, holds up a wahoo from the first day. Day 2 – We moved over to fish La Paz side and there were some school-sized dorado and rockies taken. 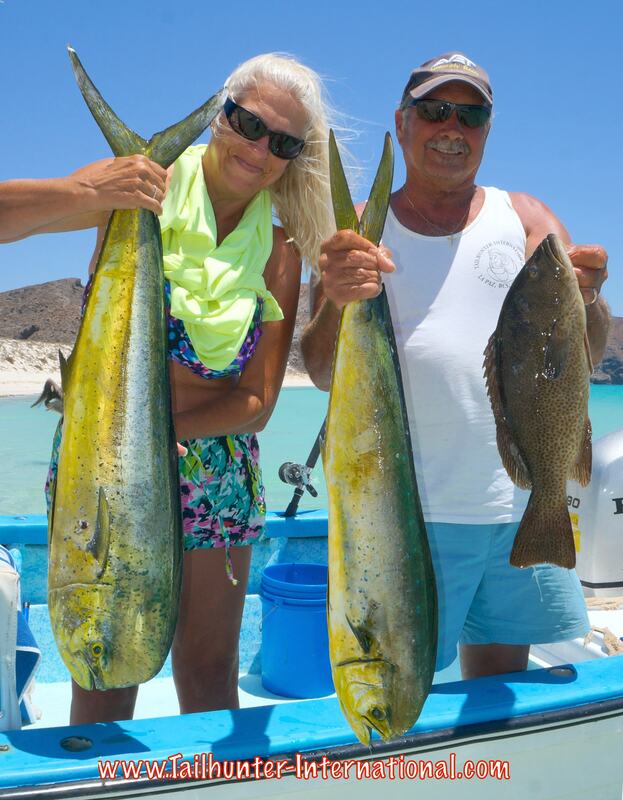 Michele (“Michele with one “L”) Conklin had the biggest dorado of the day and their boat also had the most hook-ups. That night was taco party night at Tailhunters for the big feed. Two wahoo and a jack crevalle among other fish that day plus two other wahoo lost for Michele and Dave Conklin. 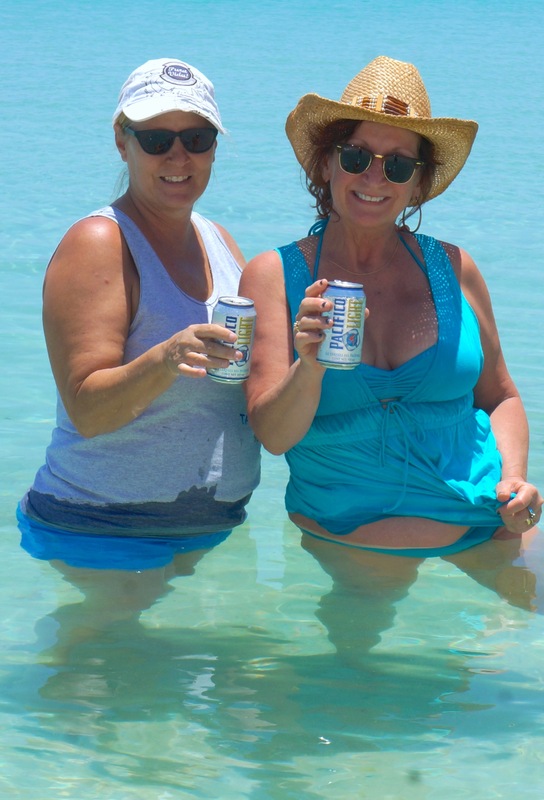 Beach gals…Cathy Corda and our own Jilly Roldan! 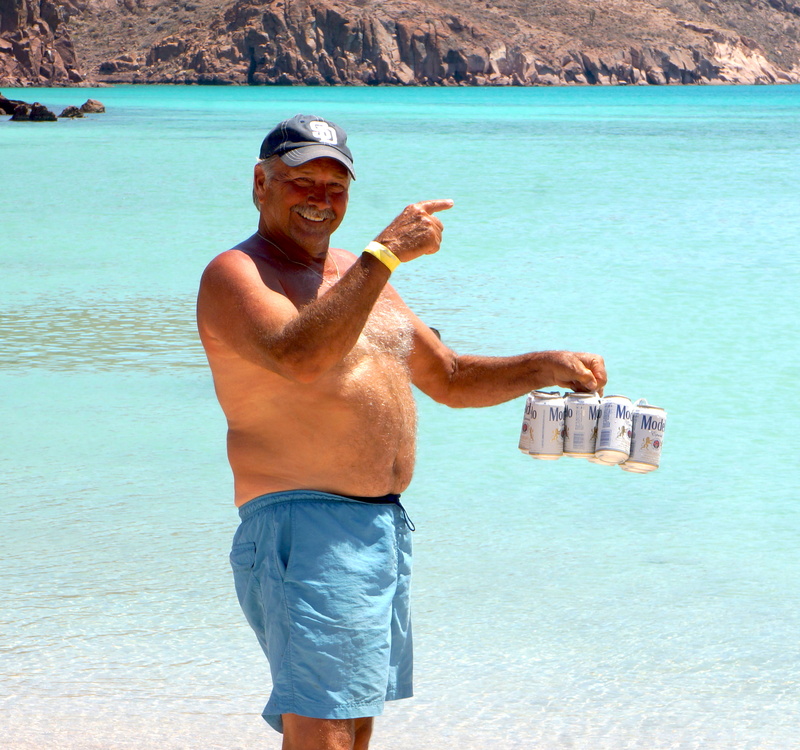 In the most heroic act of the week, when one of the boat engines got a glitch and couldn’t make to closer to the beach, Pat McDonell and Dave Conklin swam the ice chest with 4 cases of icy beer to the beach about 200 yards away . Give give give! Yes, go THAT way , David! The girls are waiting for you to bring the beer out to them! Day 4 – Actual tournament day for the money! The other days were just warm-ups! $600 jackpot on the line. Everyone went charging! Unfortunately, so did the winds and waves which were ripping for the earlier part of the day. 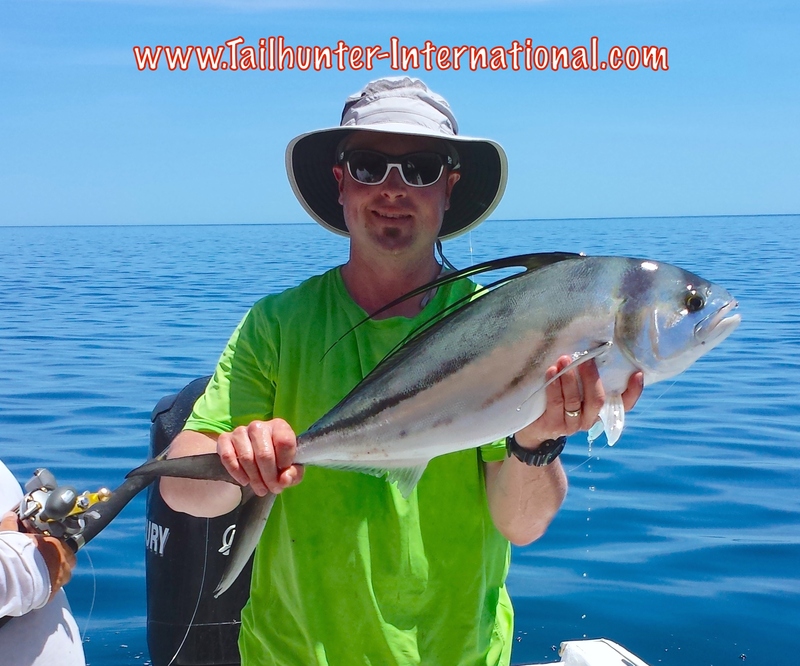 Fishing was scratchy at best for a handful of small dorado although Paul Csenar got his first marlin. 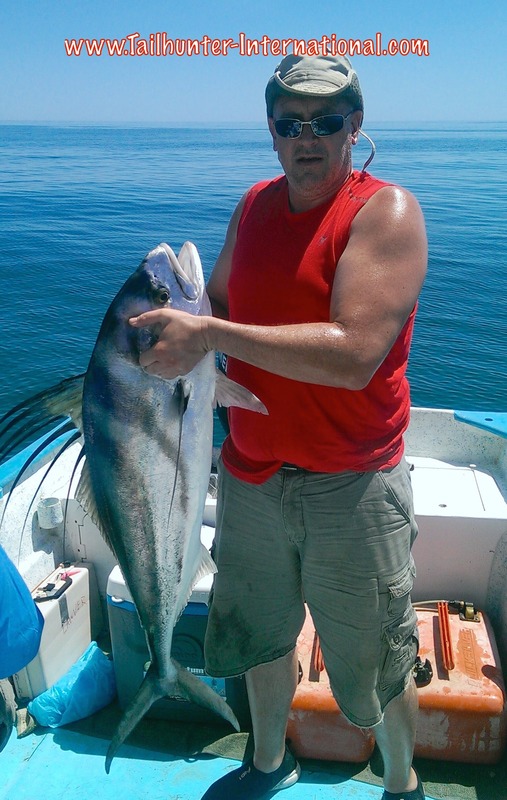 Big fish turned out to be an 11.7 pounds skipjack caught by Bill Jubb! That was it. But again, with a giant cooler of beer on the beach and another with ice-cold watermelon slices, it turned into another beach party! Pat McDonell assumes the position in front of some of the pangas or our La Paz fleet parked at Balandra Bay. 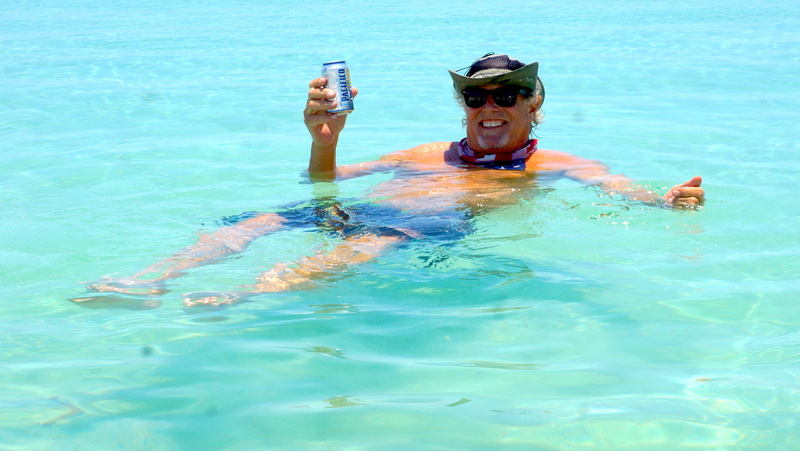 Craig Corda…living the dream! Too bad the waters are 80 degrees. Beer 33 degrees. Dinner that night at Tailhunters for our all-you-can-eat Hawaiian Rib Dinner! Oh man…talk about sticky fingers and smackin’ lips! Bil Jubb took all the money and he told everyone he was covering the drink tab. Then, he donated the rest of the winnings to FANLAP, which is one of our favorite charities here in La Paz! The balance of that amount of more than $400 is enough for two high school scholarships to pay for the expenses of two high school students for a year. (Here in Mexico, mandatory public school is only given until 9th grade…after that, the individual must fund further education themselves!). What an incredible ending which drew much applause and high-fives! Thanks to Bill for doing that. But, that wasn’t all…upon departure, Dave and Malina Lindell (from Pendleton, OR) two of our frequent amigos here to Tailhunters left us another donation with enough to fund possibly another two scholarships! We are speechless and grateful beyond words. Blessed! THANK YOU EVERYONE! THANK YOU WESTERN OUTDOOR NEWS and PAT MCDONELL. THANK YOU FUN BAJA. THANK YOU JILLY ROLDAN and our TAILHUNTER CAPTAINS, STAFF and RESTAURANT FAMILY and a special SHOUT OUT THANK YOU TO BILL JUBB and DAVE and MALINA LINDELL for making a difference in some young lives! That’s our story! God bless all you dads! What a monster pig of a fish! In all my years have never seen a wahoo THIS FAT!!!! 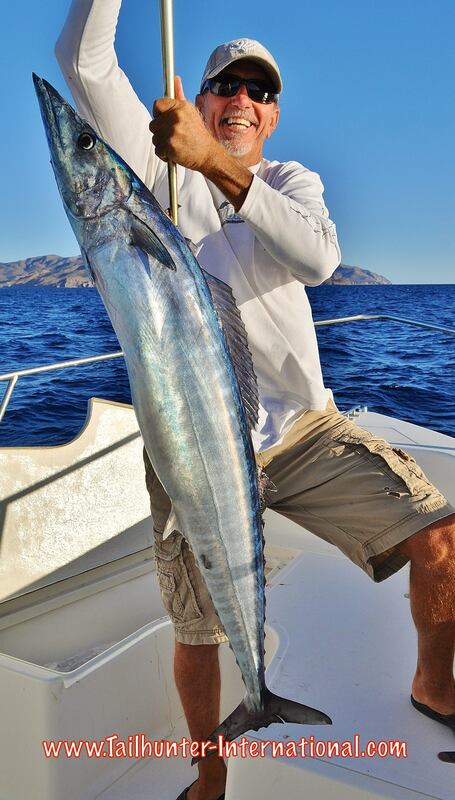 Tim McCrink with a huge wahoo caught on a rapala with Captain Mundo out’ve Muertos Bay yesterday. The fish is curved…it’s over 6 feet long! 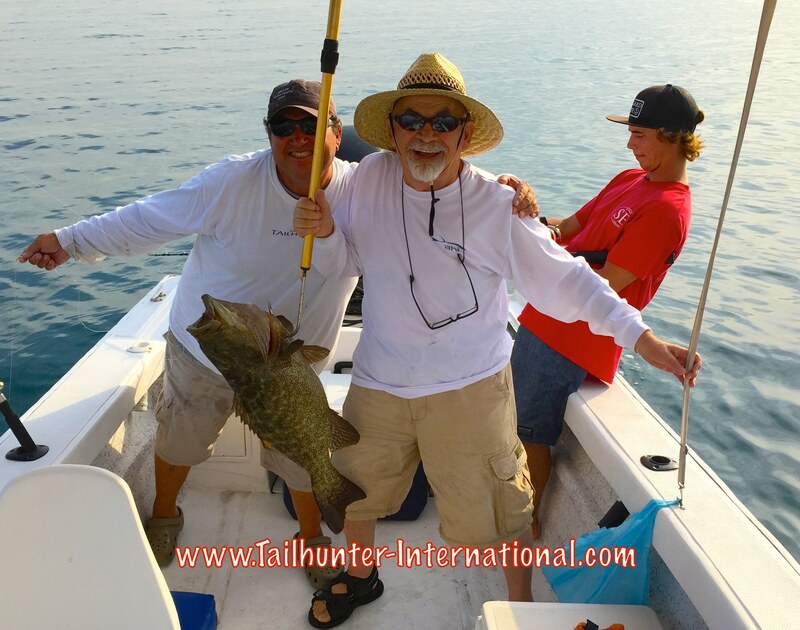 Estimates from captains and clients alike who were on the beach put the fish at anywhere fro 70-100 pounds. Another fatty wahoo! Carl Herrmann on the right with Captain Pancho and long time amigo, Bruce Dodge from the Glendale CA area. Captain Armando put Ed Bird from Sacramento onto this good wahoo. Rich Keogh helps hold up the head! Great amigos and always good to see them down here! Marrion Lawver and Uncle Ron Sr. with Ron’s marlin. Marrion is from Kansas and Ron hails from Washington on his first trip. The marlin was not able to be released. Some good roosterfish action this week. From Oregon, Denny King, loves the light tackle. On his first trip, he did close to 12 different species of fish in 3 days. Rooster was released. Captain Pancho with one of the funniest guys to be around. Jude “Big Boy” Martinez has himself a whopper-size pompano. They brought it over to Tailhunter Restaurant for tacos! This is an amazing guy! Jake Van Hemelryck from Eagle Idaho was down for two weeks at the Se Habla La Paz Spanish Language immersion school knocking out some extra college credits towards his teaching degree. 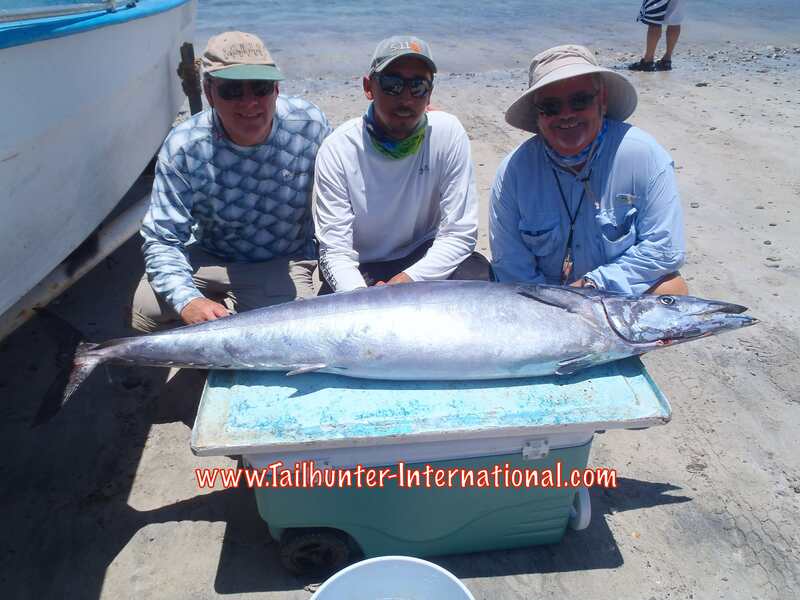 He had weekends off so he went fishing with Captain Rogelio with our Tailhunter La Paz fleet. No problem! 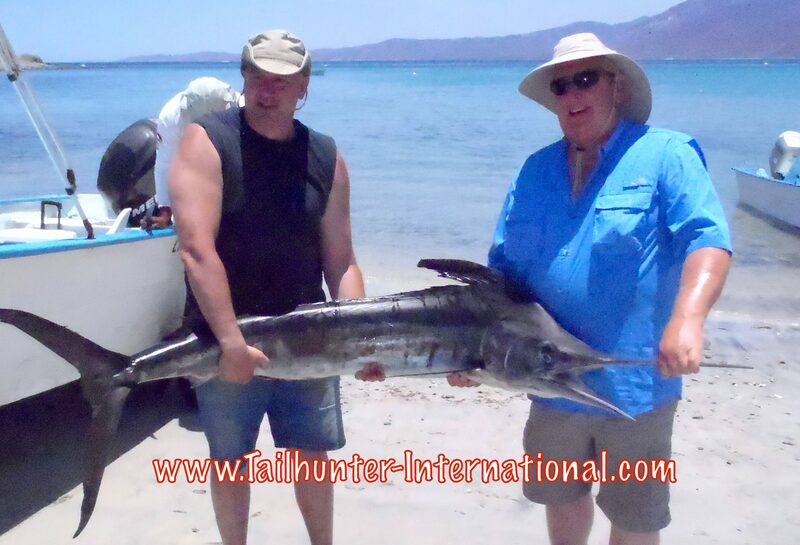 He caught roosterfish, dorado, pargo, cabrilla and other species. Jake is pretty inspiring. He holds powerlifting and swimming records and swam for the U.S. Paralympic team. The fish didn’t have a chance. Marlin were alot more active this week and alot of amigos had shots at them. Terry Biggs had this one going for a bit and sent me the photos. This one got away but great shots! 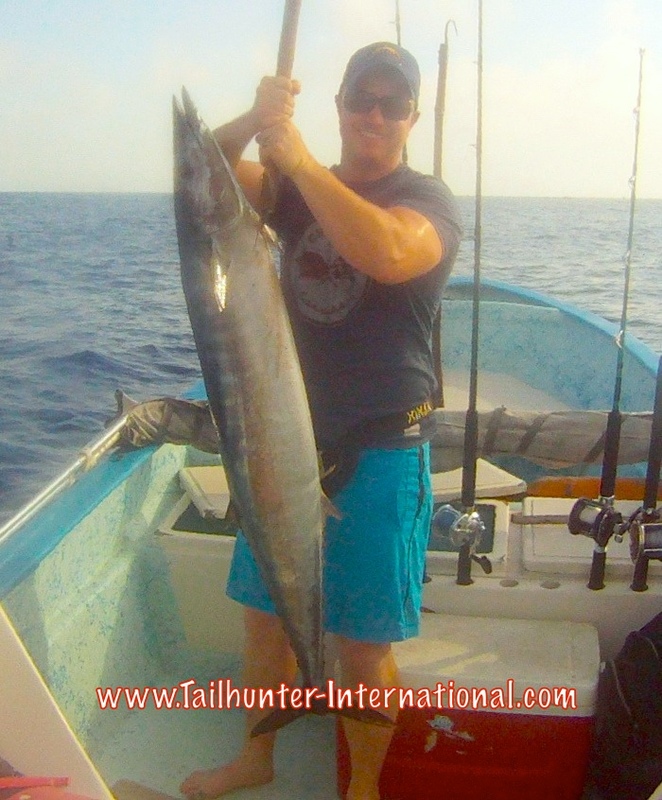 Mitch Embry dialed one in finally after 4 days of fishing and stepped up with this nice wahoo. Pictured here with Captain Armando and Ed Bird. 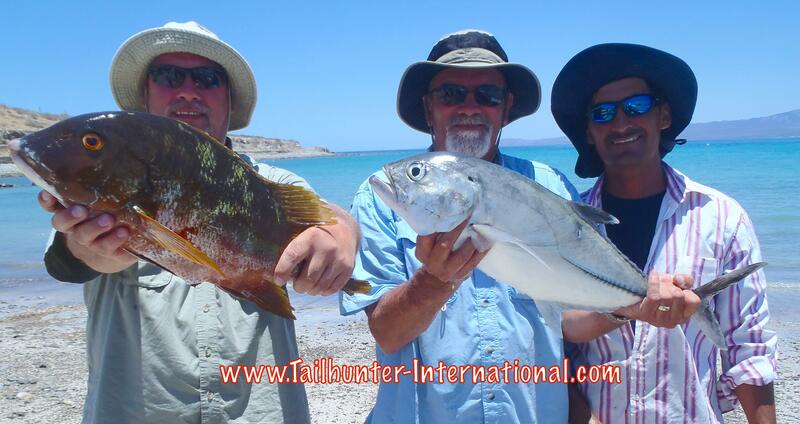 Terry Biggs with a barred pargo and Rich Keogh with an ojoton jack. Both great eating. (the fish not the guys!). The guys are from Sacramento! Captain Adolfo with them. Some video of the winds and waves behind La Concha Beach Resort Hotel during Blanca. Winds were running about 50 mph. Turn up your sound! Well, we “survived” Hurricane/ Tropical Storm Blanca. I say “survived” because it was almost a non-event. I don’t want to scoff at the weather as it needs to be respected, but I think everyone in S. Baja was a bit nervous when Blanca appeared on the radar. Winds over 100 mph and 10-16 inches of rain were predicted and many folks in the state have yet to fully recover the devastating effects of “Odile” last September that tore the state apart. In that regard, folks could be seen boarding up windows; hauling out their boats; stocked up on water and batteries, etc. Even us at Tailhunters, dismantled our restaurant and set up sand bags. Then, for 4 days, we watched and waited. And waited. And communally huddled before our computers and smart phones watching every bit of social media as the ominous storm approached. Then…nothing really happened. Some big waves. A bit or strong rain (in some cases only minutes). And strong winds. And that was it in most of Southern Baja. Further north of La Paz, they got some heavier rains, but nothing biblical. In La Paz, there was some debris. Lots of dust. No flooding. For us we lost a day or two of fishing. And that was only because the port captain prevented boats from leaving the bay. For the most part, seas stayed flat and we could have fished. But, I understand the precaution. When we did get back on the water, early in the week, it was with some trepidation. Fishing at Las Arenas had been pretty darned good . The wahoo bite had been off-the-charts. For La Paz, we just started to finally get into some nicer dorado. Well, when we got back in the water after the storm, it wasn’t totally expected. Waters were green and cloudy. Water temperatures had plummeted 8-10 degrees from 80 to the low 70’s. Fish were around. Our anglers saw them. But, they didn’t want to eat! It took a few days, but with each passing day post storm Blanca, the waters cleaned up and fishing got just a little better. Not 100% back to previous conditions, but we started seeing some wahoo again. (some really BIG wahoo!) Billfish got a little more active. Dorado seemed to get hungrier as well. Our La Paz boats were finding some spots of small to medium dorado which was nice to see. It’s about time we see some better dorado! We even saw our largest dorado of the year which were 30-40 pounds. 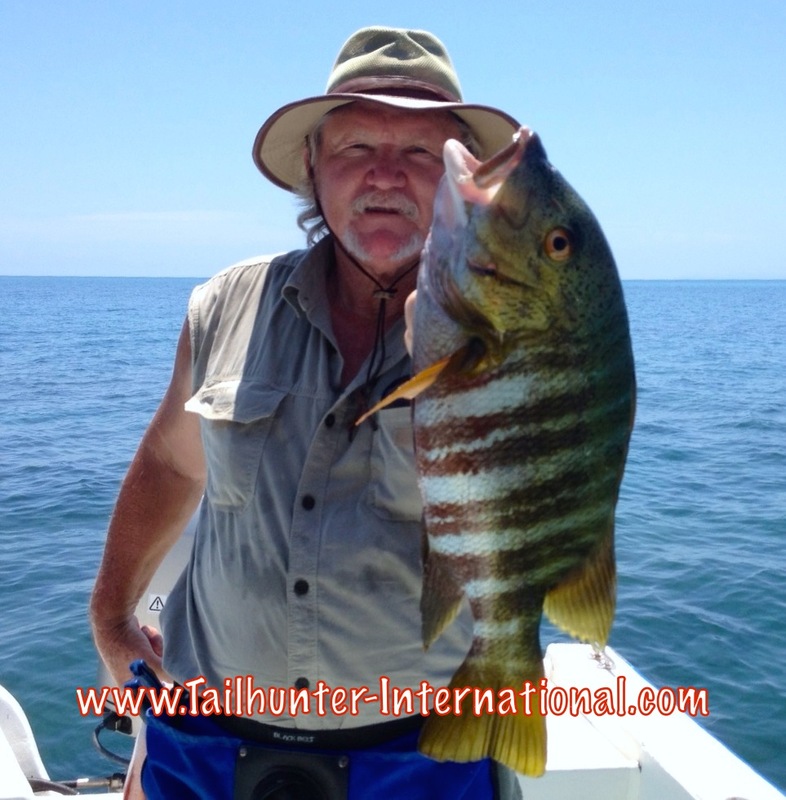 Inshore, some roosters were biting as well as yellow snapper, cabrilla and pargo. Still too early to be definitive, but signs are encouraging. There’s alot of variety around. Every day seems different. Dustin Bremmer had only one day to fish and he made the most of it with this fat yellowfin tuna and also a wahoo with Captain Armando. This should be on a Christmas card! Six-year-old Caleb Davis is genetically progammed to be a good fisherman. Dad runs a sportboat out’ve Orange Co. , California. 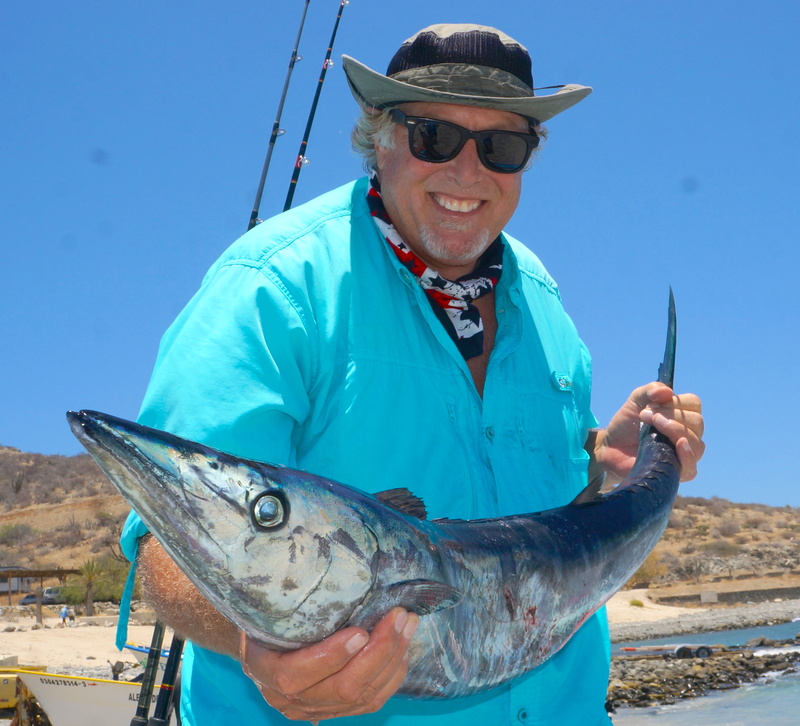 Gramps is our amigo, James “Hawk” Davis who lives in La Ventana and is a stellar angler as well. Caleb rocked this big wahoo all on his own. 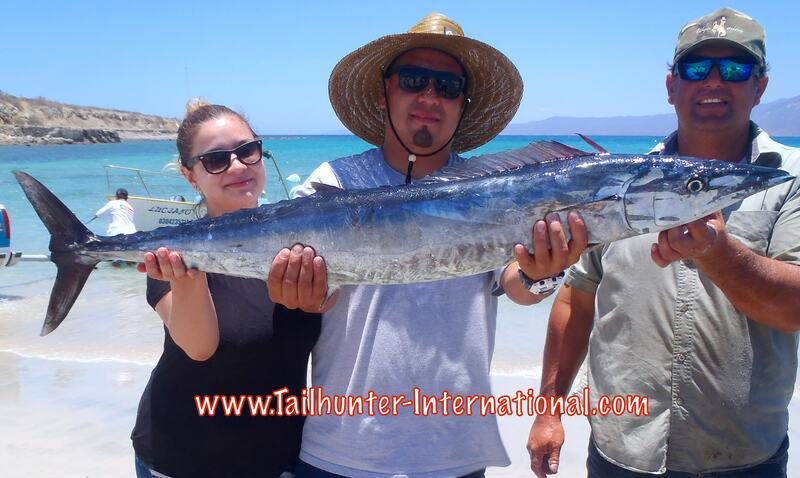 From Hawthorne CA, Candi and Mike Jimenez with Captain Armando did this nice wahoo with only 1 day to fish this past week. Nicely done. From Sacramento, a really fun couple. 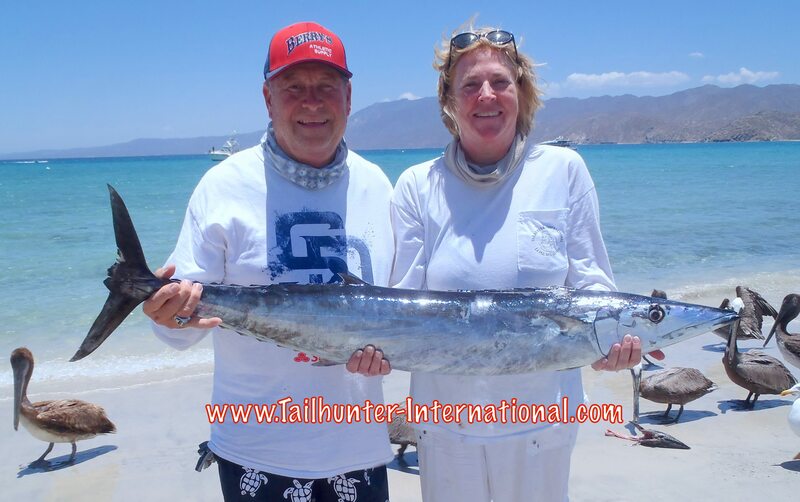 Dani and her husband, Harry Gist, also got themselves a wahoo this week. Standing on the beach at Bahia de Los Muertos. They got a bunch of pargo and cabrilla as well on their 2nd day of fishing and spent a day snorkeling at the island with the sealion. It was an incredible week for first timers and anglers who only had one day to fish! Dave Bosteter from Arizona only fished one day. He only caught ONE fish! 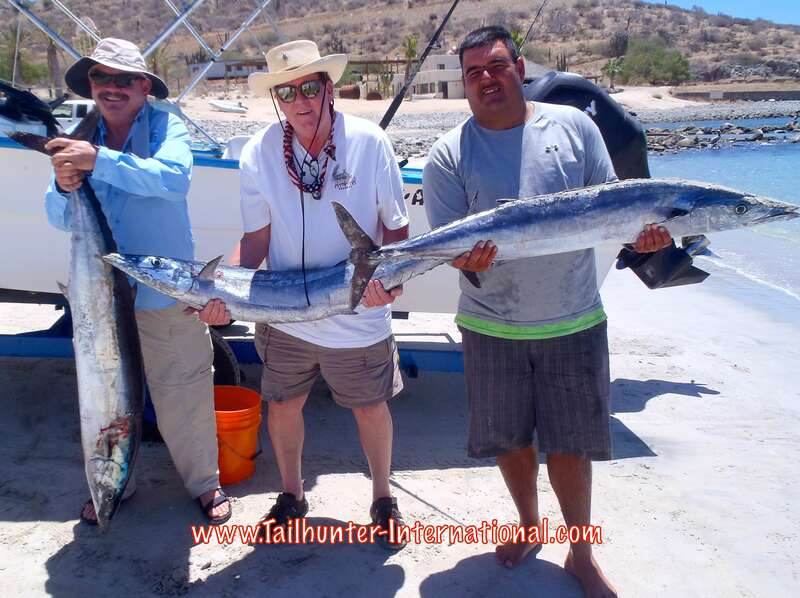 But, check out his big striped marlin with Captain Pancho! He also did the fish on light tackle too! The fish could not be released. Our son-in-law, Brian Reid, did a bit of damage this past week. 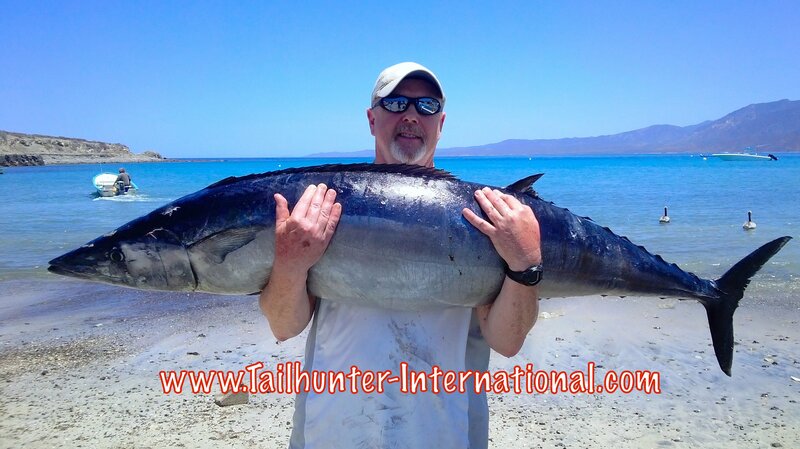 He lives in Las Vegas AZ and this is one of his two wahoo he put in the tank off Cerralvo Island. 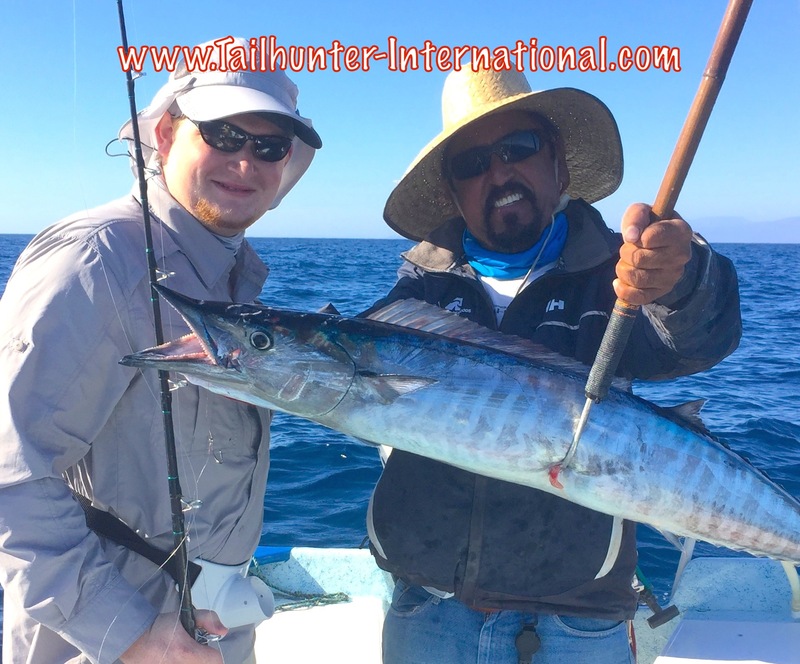 Our Sacramento amigos with Captain Victor, Henry and Becky Harvey managed to get a nice wahoo on but had several others almost to the boat. Henry also got himself his first marlin this week! Our gal…also our daughter…Jessie Reid of Las Vegas. She’s funny. Slept on the panga all day. Woke up for 5 minutes when her rod went off. 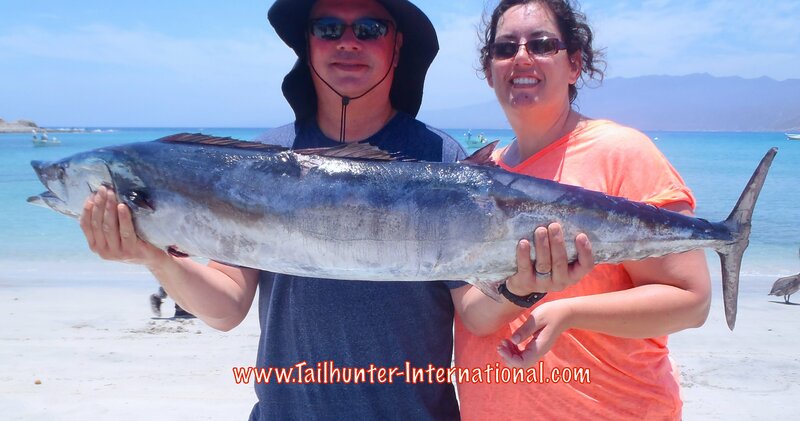 She hooked this nice wahoo and went back to siesta! She makes alot of things look easy. Love how she rolls. Fun photo with Orhan Gurbuz and popular Captain Rogelio “Jolly Roger” Camacho and a nice cabrilla near Espirito Santo Island. Just a darned fine photo! Capitan Gato at sunrise with another wahoo. Thanks for the photo, Hawk Davis! Two of our fun regulars and great fisherman, Kevin and John Nagy with a pair of ‘hoos! STORM BLANCA IS A BUZZKILL! At the time you’re reading this, we’ll know what, if any effect, Hurricane/Storm Blanca will have done to us. I’m writing this about noon of Sunday trying to get this up and posted before we lose power. We already lost power a few last night for short perdiods. I’m hustling to write so excuse any typos! As I write this, everyone is watching to see what will happen. We have been tracking this for days. It has been like watching a roller coaster ride because it has changed up and down by the hour. Right now…The storm sits a couple of hundred miles south of us where is seems to vary between a dangerous Category 1 and 2. (It was up to to a 3 and 4). 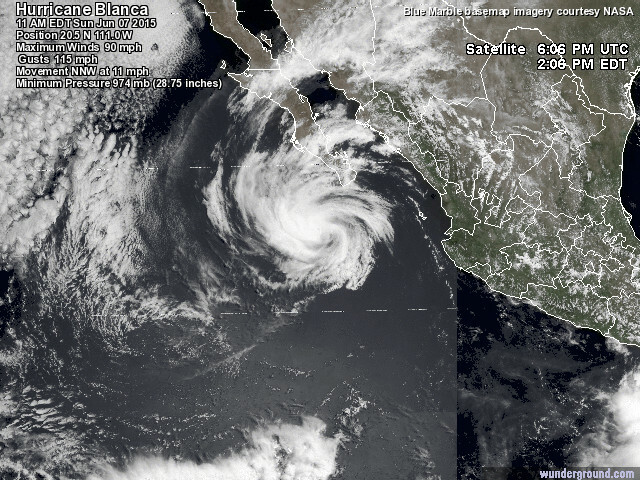 The whopper that hit Baja last year was a Cat 4-5 with winds close to 200 miles and hour. Named “Odile”, it’s fresh in our memories and many of us are still recovering so we’re all anxious to see what nature has in store. But, it’s coming. As of this moment, they CLOSED CABO AIRPORT and the La Paz marinas have been closed for two days. If you’re coming down in the next few days, I would suggest you call your airlines. This will probably last through Tuesday. Check! As of right now, the La Paz Airport is open. At the moment, predictions have the storm diminishing it’s effect on us here in La Paz. The eye of the storm has it going west and north instead of directly overhead. It will make landfall much further north on the Baja Peninsula and probably bring California some much needed rain. For us here in La Paz, we’re probably gonna get a few inches of rain today and tomorrow with some winds up to 60 MPH by tomorrow. It’s not like Odile last year, but not to be taken lightly. For sure . strong winds in the 20-40 mph category are predicted to blow Sunday, Monday and Tuesday which is much more problematic. Even though the sun will likely be out, anything in double digits will make it impossible to be out on the water for our panga fleets here in La Paz. Even if it’s safe, it’s not gonna be fun out there. Plus, our bite has been so great for wahoo and roosters and our dorado bite just hit stride so I’m anxious to see how the bite will be affected post-Blanca. To the government’s credit, the CFE crews are already out and marshalled in front of Hotel Marina. These CFE guys and their big trucks saved us all last year when the big one hit us and many of us were out’ve power for several weeks. The CFE guys are the power company guys and boat loads of the landed after last year’s hurricane and it was like the marines had landed or the cavalry showed up! With no power, they’re no electricity. No cooking. No pumps to pump water. Nothing! The trucks are already here now and ready to go. We talked to one of the CFE guys last night and he said they are actually parking themselves at various hot spots ready to immediately tackle problems. Anyway, nothing to do but wait and see. Last year, Odile took the same track and at the last minute turned inwards and kicked the hell outta lower Baja, after we all thought it was going to pass us up. As or Sunday, tracking Tropical Depression Blanca for the next few days. Another sidebar story…Sunday…today is election day. NO ALCOHOL SALES IN LA PAZ are allowed. So, with the storm and all, we figured we might as well close the Tailhunter Restaurant Bar and also let our employees spend the day with their families and taking care of their homes. So, I ran out to the market Saturday night to stock up on batteries, tape, canned good, etc. We are always prepared, but never hurts to have extras. Last year before Odile, no one seemed to pay much mind and got caught flatfooted. So, this year, everyone would be making a run of emergency supplies at the market. I have run into several friends who bought lots of beer on Saturday and stocked up their ice chests. However, they ended up drinking it all up and now are in a panic now trying to find beer! Anyway, here’s what’s been happening. It’s been a solid week! Wow, that wahoo bite…not much to say except that in the last 3 weeks, we’ve gotten more wahoo than in the last 5 years combined. I hate to sound cocky but this has been incredible. Pangas are getting 1-5 wahoo per day. The only clients of ours not getting a wahoo are those that are fishing for something else; flyfishers; or folks who are hooking them but losing the speedsters. These fish are all quality 20-50 pounders! Yikes! Hahahaha…what can ya do? Besides the wahoo, we’re still getting decent numbers of those tasty white bonito (meat like tuna!) 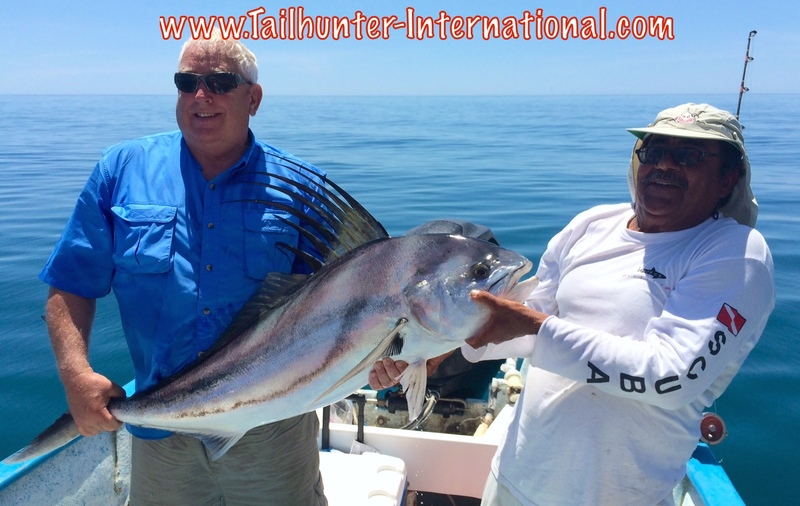 and rooster fish have been in the 20-40 pound class. Plus, we’re seeing pompano, jack crevalle, the occasional sierra (must be some cold water around), plus hooking a marlin or two as well as the marlin and sails are starting to wake up! The bite diminished towards the end of the week on Thursday, Friday and Saturday as big rollers from the storm to the south started coming in and bait got harder to find. We stopped fishing the area and see how things pick up after the storm. 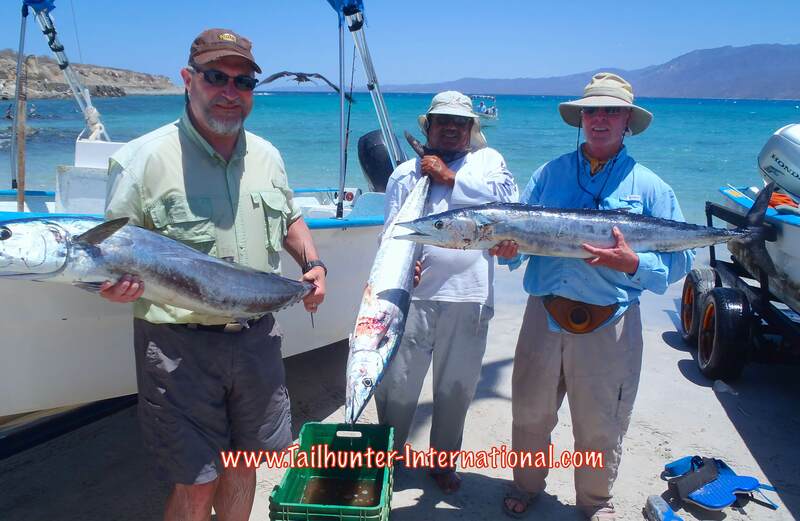 Our Tailhunter La Paz Fleet has been consistent for action. Inshore stuff for pargo, cabrilla, snapper, amberjack, rooster fish, jack crevalle and bonito has produced 20-30 fish days with lots of released fish, but lots of fun battling these fish in the rocks. The best news is late in the week we finally started seeing some larger schools of dorado that we’ve been waiting for. Fish are small to medium…5 to 15 pounders with many of the anglers releasing the smaller fish, but it’s encouraging to finally see the dorado moving in. Also more billfish in the area as well which should only get better with so many more smaller dorado around. 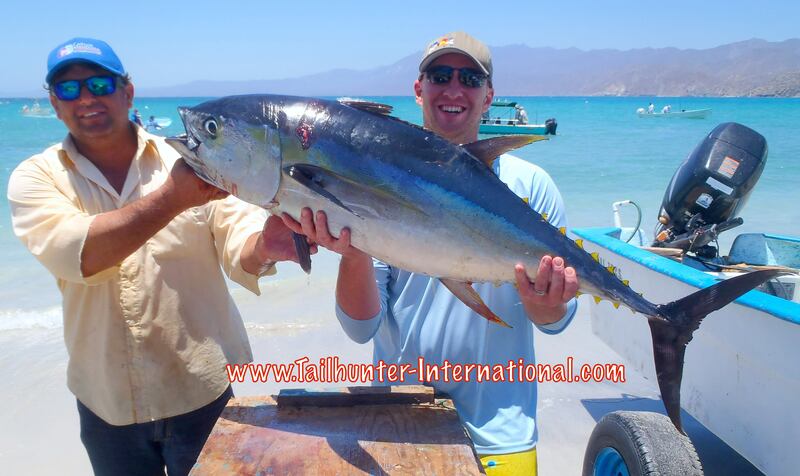 We fished La Paz until late in the week when the Port Captain closed the port and prevented all watercraft from leaving! Pretty good first trip for Riley Florence from Kansas. 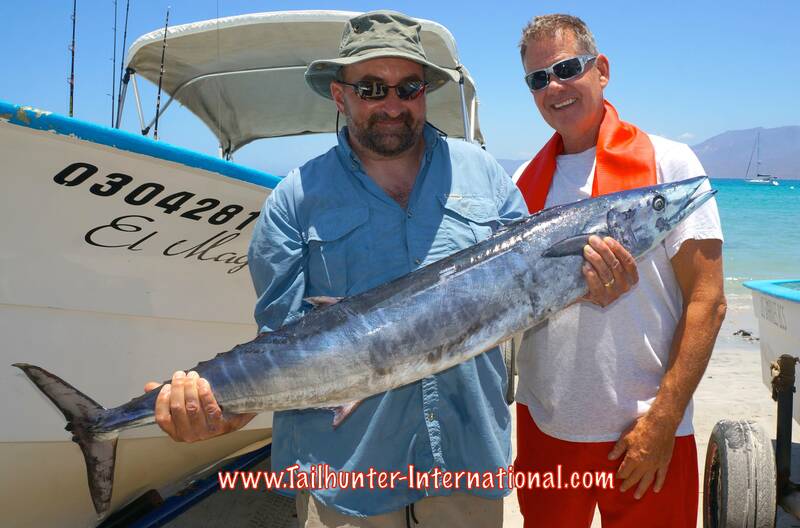 Got his first roosterfish and this nice wahoo as well with Captain Jorge and our Las Arenas Fleet. Roger Thompson doing what he does so well. Nail big fish. He’s had another giant week and check out the thick wahoo here! Long run from Tennessee, with our Captain Victor, James Kilton and Kelly Donohue. 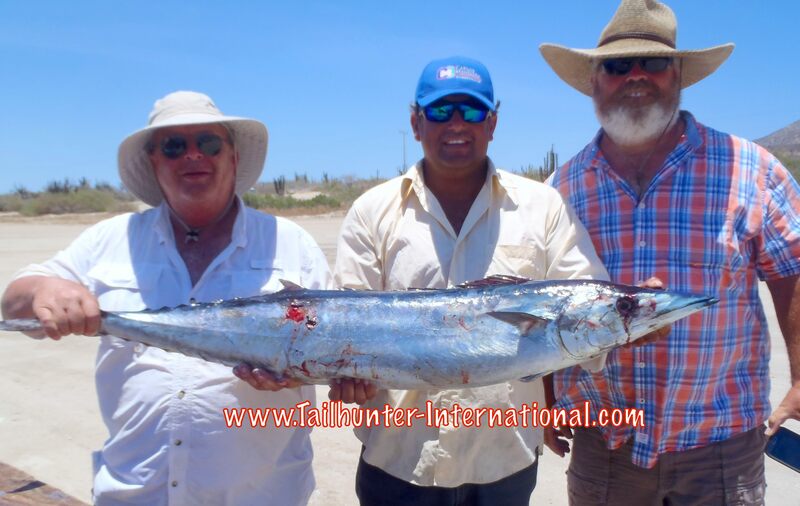 Triple on the wahoo on the beach at Bahia de Los Muertos. Charger nation! 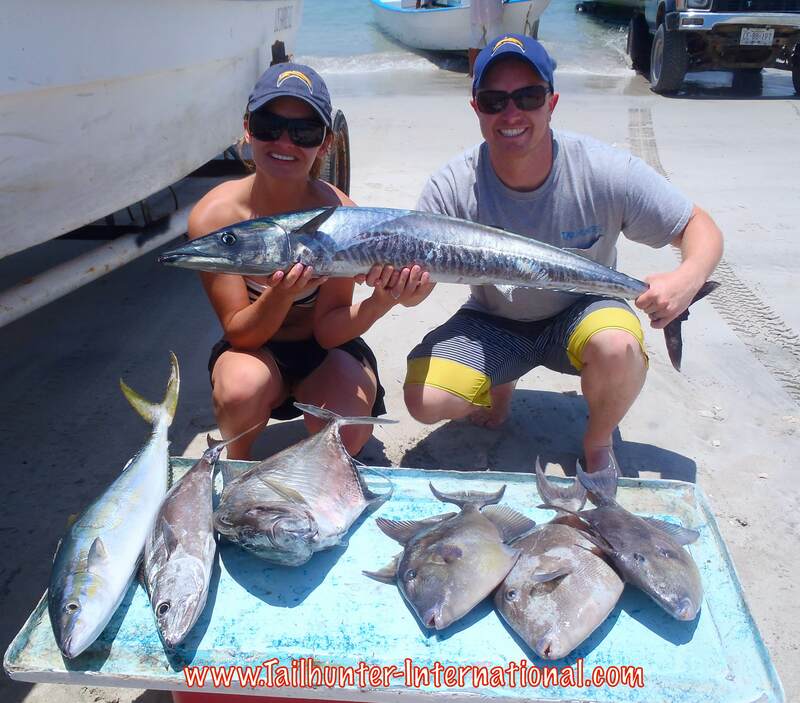 Our daughter and her husband from Las Vegas, Jessie and Brian Reid with quite a variety of fish. 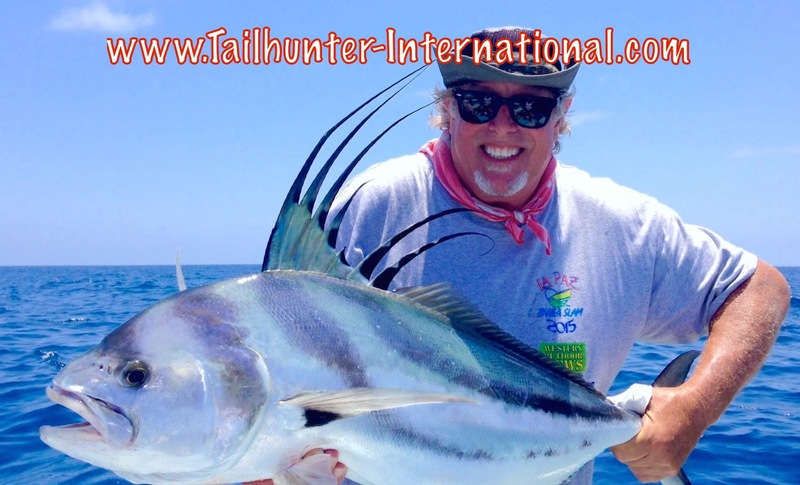 Wahoo…giant pompano…white bonito…rainbow runner and hugs triggerfish! She catches fish and always takes great photos! 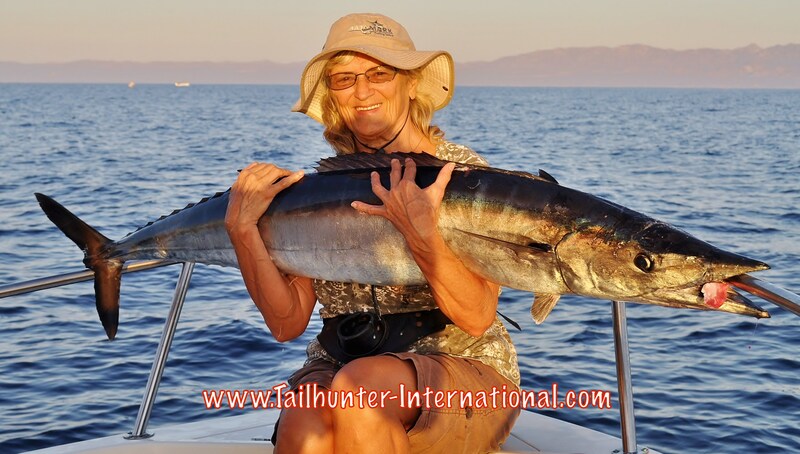 Our amiga Donna Thompson with another big skinny! The ‘hoo bit great off the island! Ash Ibrahim from San Diego probably had the most fun of anyone this week when he brought his family. 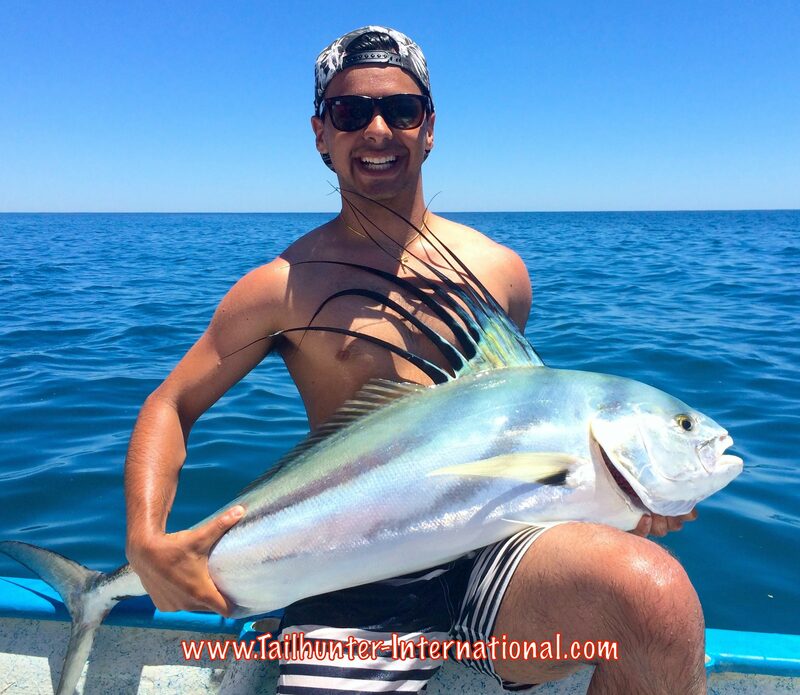 Take a look at this roosterfish then watch the video below of how he released it! Big smiles for Nicole Ibrahim showing off her rooster as she came down this week with her family to celebrate her graduation from college! Nothing wrong with this photo! Anthony Ibrahim lives in San Diego is about to hit his 3rd year in college in Washington DC. He got himself a nice rooster that he photo’d and released! Army buddies…friends for life! 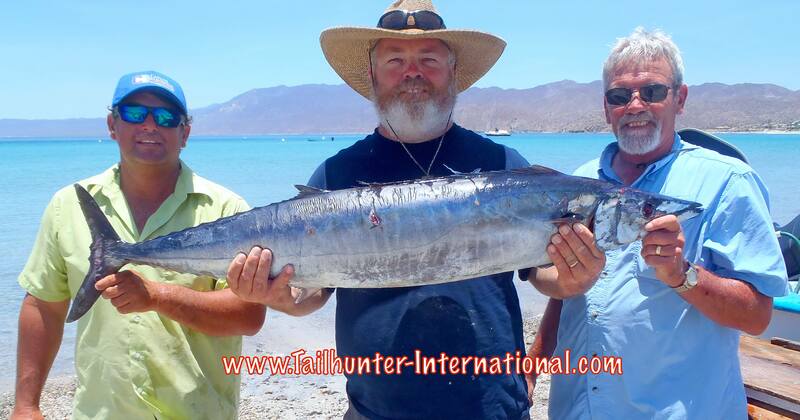 Owen Hofecker from Johnstown, Pennysylvania and Paul de Haan from Bountiful, Utah triple teamed with Captain Gerardo to put the hurt to three wahoo off Cerralvo Island. Captain Armando with Doug Edwards wahoo and Penni De Haans striper. On the beach at Bahia de los Muertos. The marlin meat was nicely donated. After a 2 hour fight, the fish was not able to be released. Nothing like the kids’ smiles! 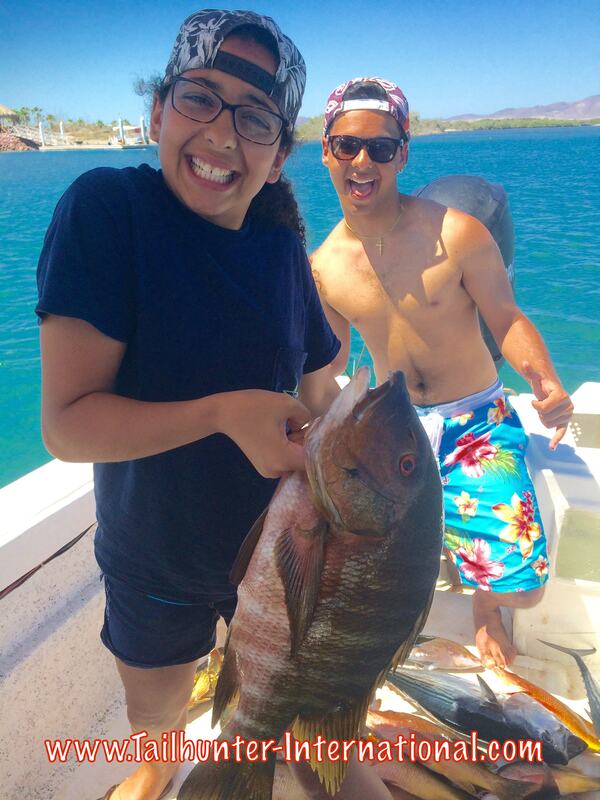 Sofia Ibrahim from San Diego got the biggest pargo of the day fishing around Espirito Santo Island. Brother Tony throws the photos bomb! 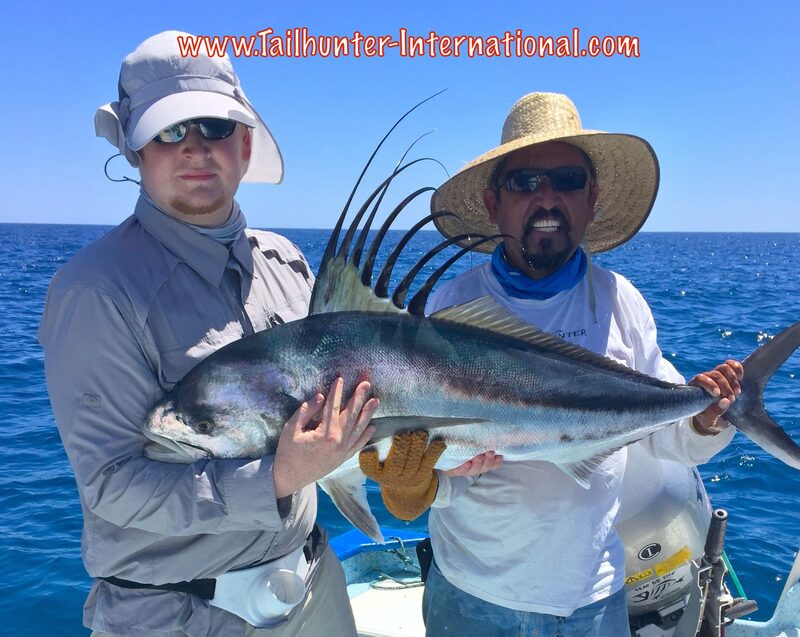 First rooster for Riley Florence from Kansas with a nice catch and release with Captain Jorge. The water must still have some cool spots in it! From San Diego, Jim Bovee with a huge sierra! 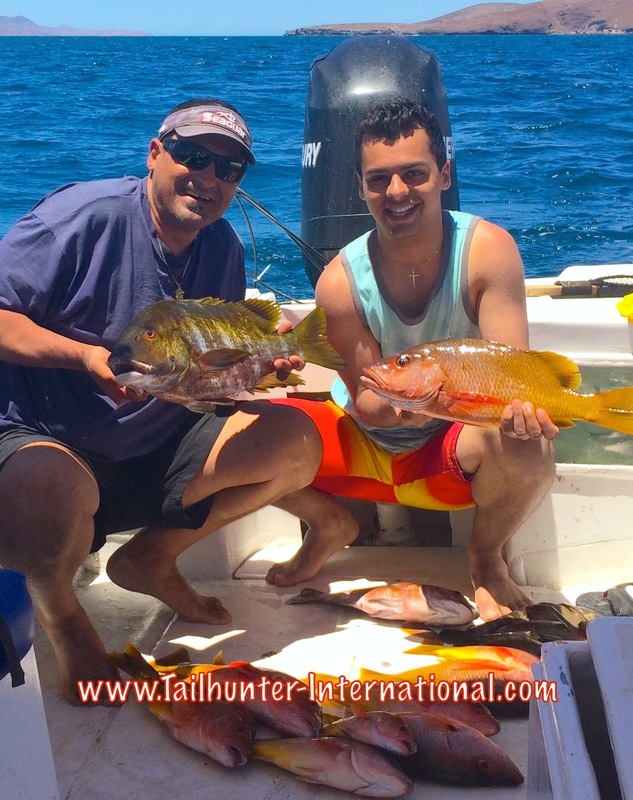 Ash and Tony Ibrahim with some great dinner stuff…cabrilla and snapper taken off the island in some great action! For the most part, great weather and great fishing conditions most of the week resulting in some pretty solid catches. Lots of sunshine and increasingly better looking water all-the-way-around helped our anglers put some bend in the rods for a 2nd straight week. Our biggest problem was a scare that popped up on the radar about mid-week showing a big tropical storm headed our way that was going to bring rain and strong winds beginning this weekend. With so many folks still nervous about Hurricane Odile from last year and many people still smarting over the recovery, the last thing we need is a storm! As far as fishing is concerned, our bite has been so good the last two weeks, I surely wasn’t looking forward to ANYTHING that would mess up the waters or keep folks ashore! Had this storm hit us, it would have brought 2-4 days of intermittent rain. 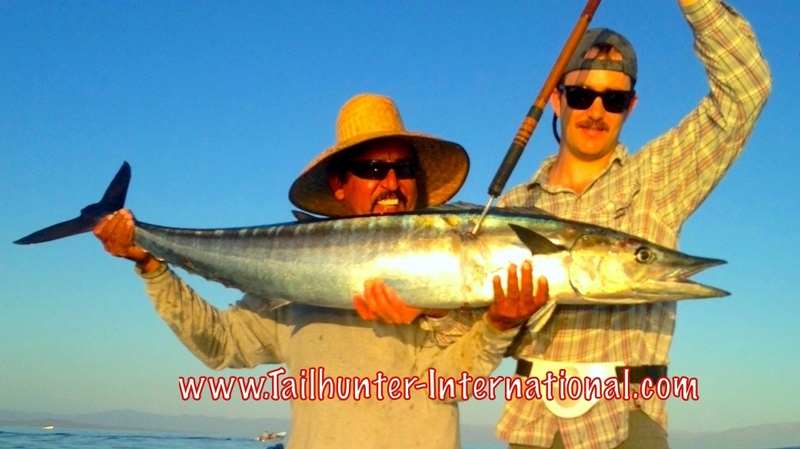 “We were on the water at 5:30 this morning and had our first wahoo on the boat by 6am. At 6:15, we had another. Next was a double hookup around 7am and we landed both fish. We also saw 1 giant free swimmer just under the boat while fighting these 2. We hooked 2 more wahoo and lost 1 just before 7:30. Hooked another around 8:15 and this one came unbuttoned 10 feet from the boat. I hate it when that happens! No more wahoo bites for an hour and decided we caused enough damage for one day so we stopped to reel in the Rapalas and head back to the ramp. I slowed down, put her into neutral, and shut it down…….then wham. The short one got slammed and the bonus fish was in the box after 10 minutes of high speed runs and wahoos! I guess what I’m trying to say is it’s an early morning bite for sure. It reminded me of the “good ole days”! Some of our amigos who fished multiple days with us in the area actually got to the point where the didn’t want to fish for wahoo anymore! There were others who just didn’t want to take any more wahoo home and there were alot of very happy captains who were getting 1-3 wahoo as “gifts” to take home! 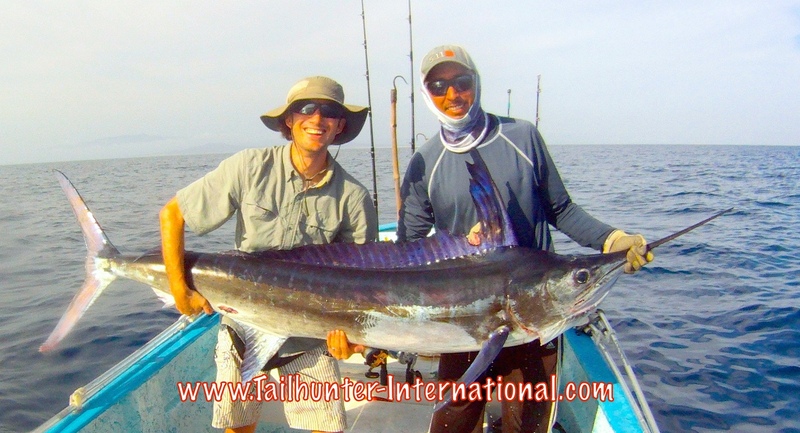 The other “fish” we’ve been doing pretty solidly on are the rooster fish. It’s not wide-open, but there’s some medium-sized 20-60 pound fish cruising around and if you wanted to catch a rooster, there was even-money that you had a good chance on any given day of hooking 1-2 fish. Way better than say, two weeks ago . All fish are getting released. Also seeing a few more dorado in the area. I’m surprised there aren’t more around by this time of the season already. Normally, we’re thick with dorado by now! 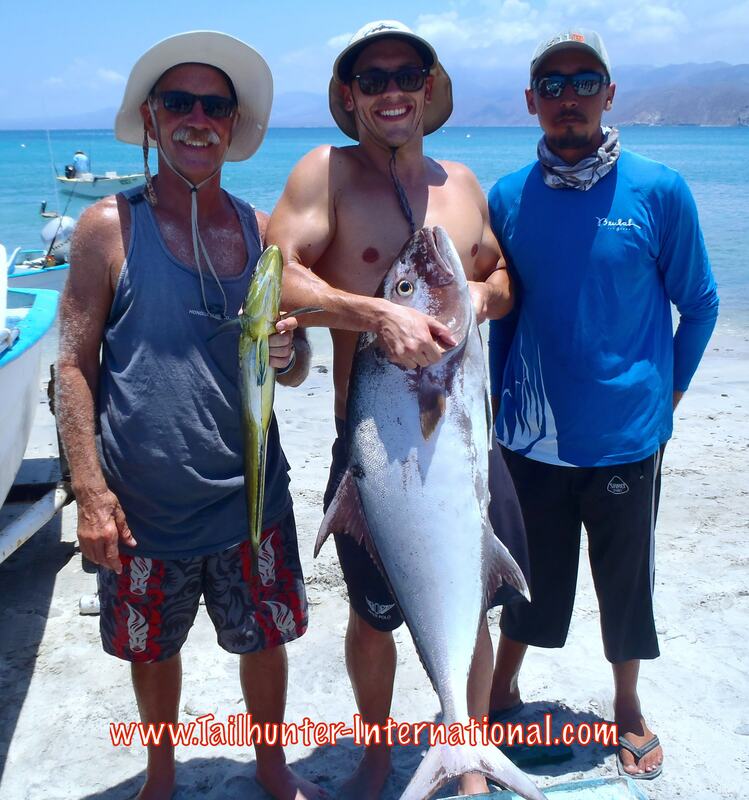 We had consistent fishing with our La Paz fleet headed straight out and working north of the city around Espirito Santo Island or around the corner between Tecolote and Las Cruces. We are definitely seeing more dorado action with fish between 10-20 pounds at the largest, but again, I would have expected more dorado by this time. The best bite has been inshore among the rocks. Good action on some really sweet pargo, yellow snapper, amberjack and big cabrilla. Lots of larger fish getting lost in the rocks. We’re seeing a few more marlin around that are actually willing to bite. Several were hooked and lost.